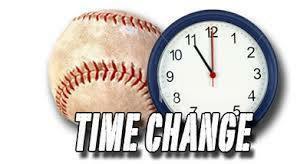 Time change for baseball tonight in Granger. There will be one varsity game tonight at 7:00 pm. Eagle baseball loses a hard fought game tonight to Granger, 1-0 in 10 innings. Tucker Taylor pitched a heck of a game putting in 7 scoreless innings and striking out 11 batters. It was a great effort by our guys and they never gave up. Proud to be an Eagle. Lady Eagle softball takes the district win over Granger today 4-3. 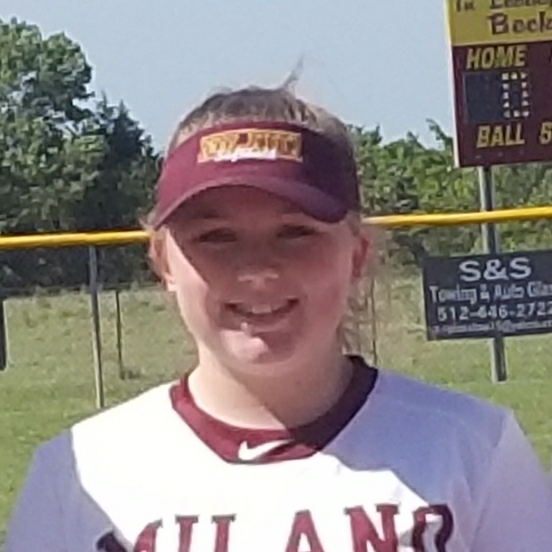 Laynie Bastow was 2-2 with a walk. 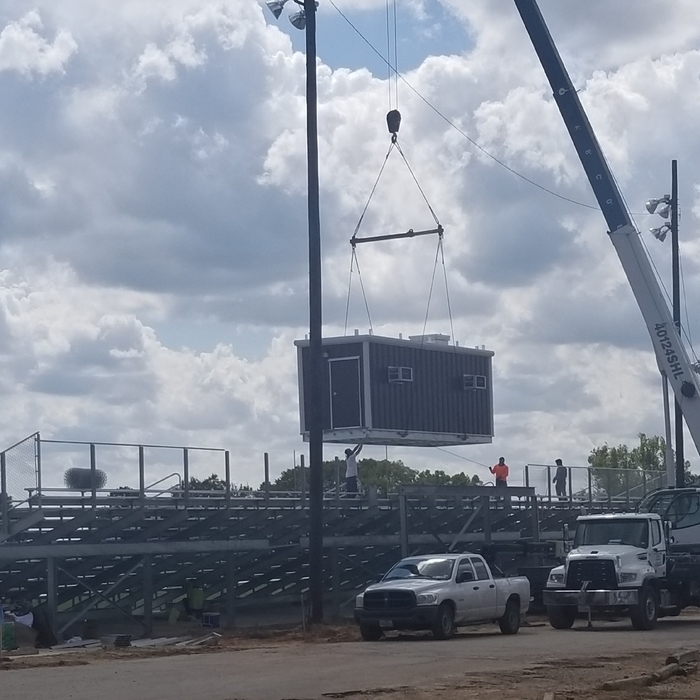 Tuesdays baseball game in Granger has an updated start time. JV will start at 4:30, Varsity will start at 7. Today's softball game will now start at 5pm. Junior High track wrapped up the season tonight running in the District meet in Holland. Everyone gave a great effort and it was a successful end to a fun season. Way to compete Eagles!! Varsity baseball beats Bartlett today 10-3. Tucker Taylor gets the win on the mound with 7 K's and Danny Cloud closes it out. Tucker went 2-4 with a double and a triple and 5 RBI's. Kathen Funburg went 2-2 with a double, an RBI, and 2 runs scored. JV baseball takes the win against Bartlett today, 9-5. Noah Benavides gets the win on the mound. Lady Eagles lose a close one tonight 5-4 in 8 innings to Thrall. Kaitlyn Telg was 3-4 at the plate. Milano boys golf team advances to Regionals placing first today at the District tournament in Taylor. Tucker Taylor finished second individually. Not pictured are Tucker Taylor and Noah Benavides who had to leave immediately after to get to a baseball game. 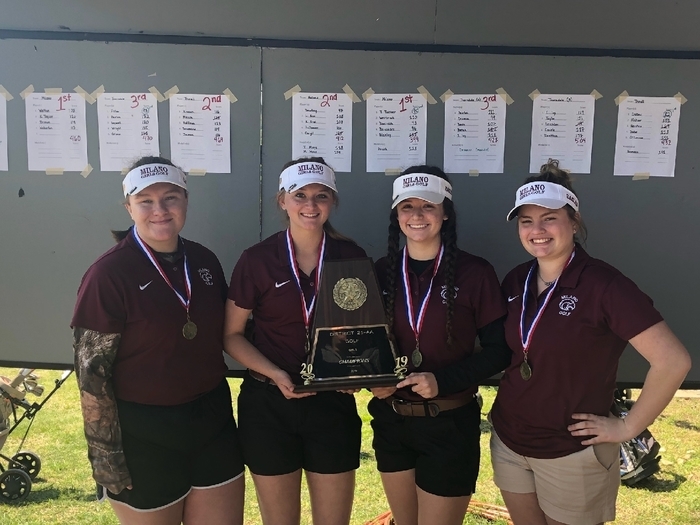 Milano girls golf team earned a trip to Regionals today winning the District tournament today in Taylor. Way to play ladies!! JV baseball defeats Bartlett today, 15 - 5. Kameron Funburg gets the win on the mound. Eagle baseball wins in Bartlett today, 21 - 2. Tucker Taylor and Danny Cloud were on the mound. Bryson Richards went 5 - 5 scoring 3 runs. Lady Eagles take the loss today in Thorndale, 12 - 0. Next action Monday in Thrall. 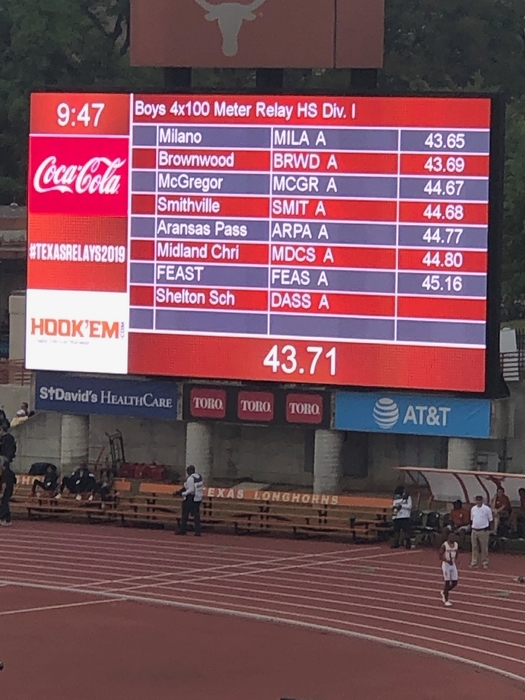 Milano 4 x 100 relay competed in the Texas Relays this morning. The team of Gus Downey, Christian Thurman, Drew Demeritt, and Devonte Jones ran 43.65 and won their heat. Nice effort guys!! 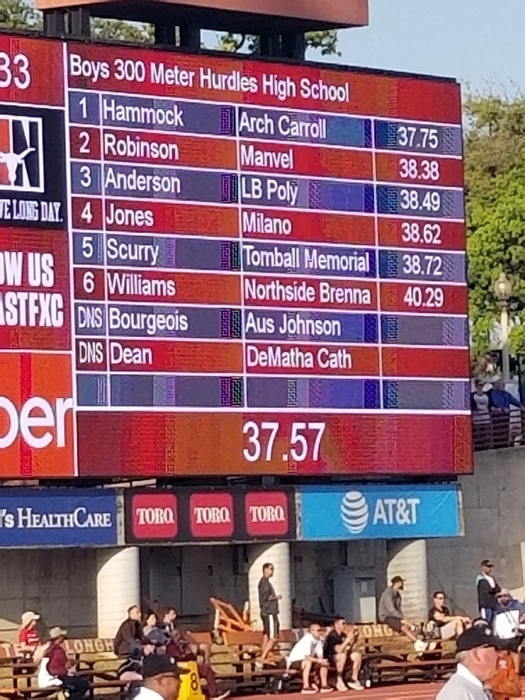 Devonte Jones equaling his PR tonight at the Texas Relays. Way to run Devonte!! Baseball in Bartlett tomorrow. Varsity at 11 am, JV to follow. Softball in Thorndale tomorrow at 12 pm. Come out and support the Eagles!! 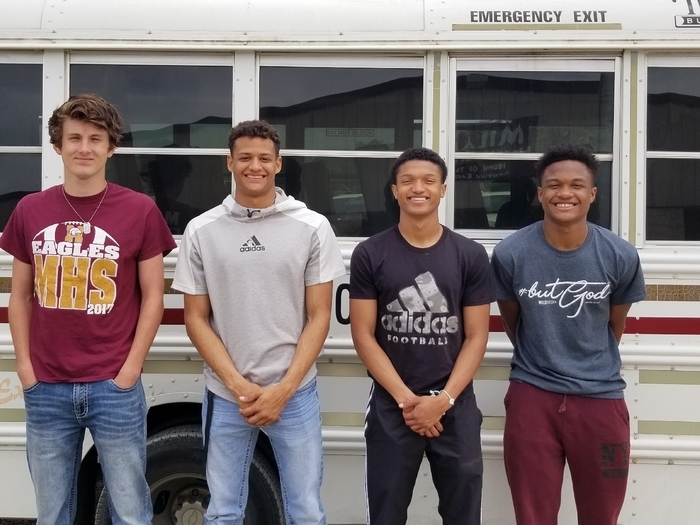 Good luck to these young men headed to Austin to participate in The Texas Relays. Devonte competed in the 300 hurdles tonight and the 4 x 100 relay competes in the morning. Good luck Eagles!! HS track ran in Fayetteville tonight. 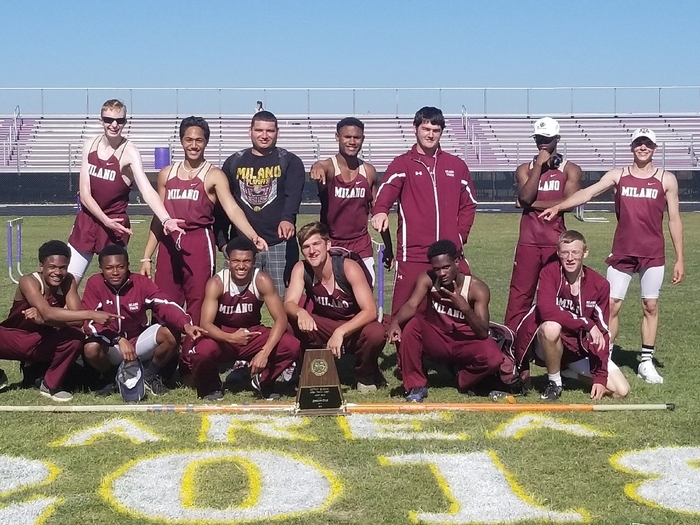 It was a great warm up for the district meet next Wednesday, April 3, at Thrall High School. Come out and support the track team in Thrall. It will be a fun day!! 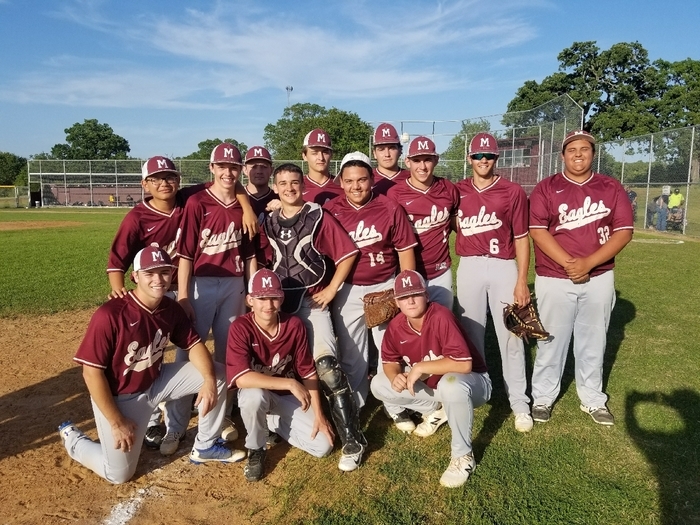 JV baseball wins tonight 6-3, defeating Thorndale. Way to go Eagles!! Eagle baseball loses 13-3 to Thorndale this afternoon. The guys fought hard battling to 2-1 through 5 but Thorndale rallied to stretch the lead and win the game. Next action Saturday. Lady Eagles get the win over district opponent, Bartlett, 12-1. Jenna Lewis had 13 strike outs and Kristian Taylor went 2-3 with 2 RBIs. 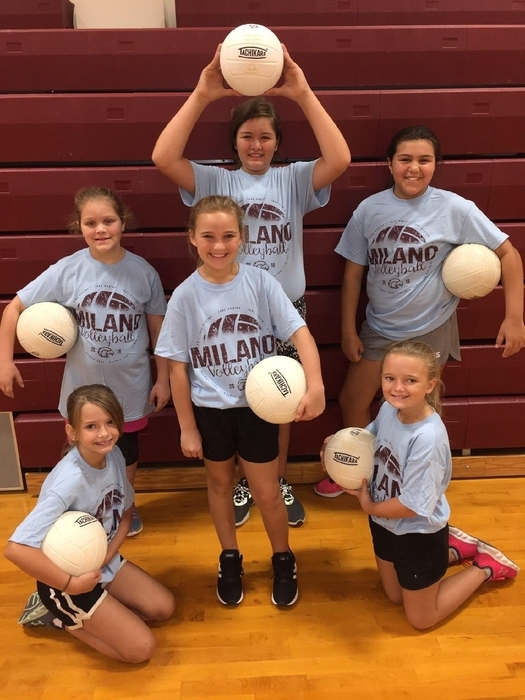 A big THANK YOU to all who showed up to support the Owen and Dorothy Knight Scholarship Volleyball Tournament held at Milano HS today. All proceeds support scholarships for MHS seniors. It was a great time as always!! Eagle baseball loses today @ Thornde, 10 - 0. Next action will be Tuesday. Come out and support the Eagles!! Correction: Varsity baseball starts at 11:00 am in Thorndale today, JV will follow. Eagle baseball loses @ Rosebud-Lott, 7 - 0. Coach Morehead notes that the Eagles pitched and played a solid game just coming up a little short. Keep working hard Eagles. Come out and support the boys tomorrow in Thorndale, JV starting at 11:00 am. Lady Eagles defeat Rosebud-Lott today in a district contest, 6 - 0. Next action Tuesday. Come out and support the girls!! The team of Gus Downey, Christian Thurman. Drew Demeritt, and Devonte Jones set a new school record in the 4 x 200 relay running a 1:31.52. 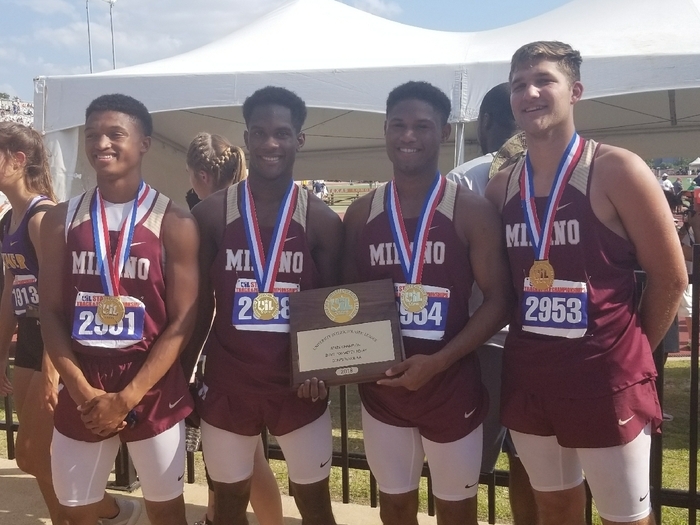 The previous record was set in 2017 by Ronnie Messer, Tim Demeritt, Devonte Jones, Ccrey Carroll. Way to run Eagles!!! Franklin track results in today. Two school records were broken last night. Parker Jones ran 1:59.17 in the 800 and Devonte Jones ran 10.51 in the 100. Parker surpassed his own record set earlier this season. 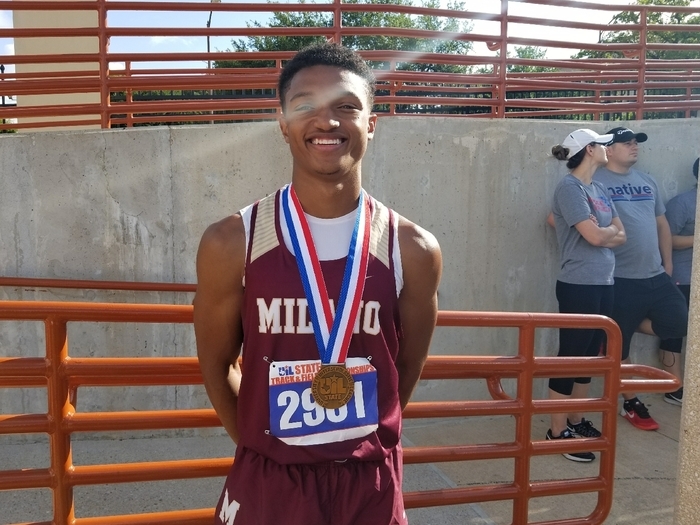 Devonte surpassed the old record set by Corey Carroll in 2017. Milano HS track competed in Franklin tonight. Everyone ran well and some great times were turned in. One more meet before district. Come out and support the track team if you get a chance!! Thanks to our neighbors in Gause for hosting a great JH track meet yesterday afternoon. It was a lot of fun and all the athletes competed well. Go Eagles!! Eagle baseball falls to Rosebud-Lott in a district contest, 9 - 2. Next action Friday and Saturday. Come out and support the boys. Lady Eagles take a district win, 2-0 over Bremond. Jenna Lewis pitched a one-hitter with 16 strikeouts. Way to go ladies!! Lady Eagles lose to Holland today in a district contest, 9 - 2, in extra innings. Action will resume after Spring Break. Eagle JV baseball takes the win today over Holland and varsity takes the loss. Next action Tuesday, March 19. Eagle baseball falls to Holland today in a close game, 6 - 5. Danny Cloud hit a grand slam homerun and pitched very well. Lady Eagles defeat Granger this morning in a district contest 7- 0. Laynie Bastow was 3-3 blasting a 3 run homerun. Lady Eagles lose to Thrall 2-0 today. Next action Monday and Tuesday. Junior High track competed in Thrall tonight. All of our boys and girls gave great effort and did their best. I am so proud of this group of young people for their talent and their commitment to represent our school with pride. Way to go Eagles!! Track ran tonight at the Tiger Relays in Thrall. Congratulations to the Varsity boys team for winning their division!! Everyone competed well and it was a lot of fun. The high school track team will be back in action after Spring Break. Lady Eagles lose a very close district game to Thorndale this afternoon, 4-3. Sterling Robertson went 2-3 driving in 2 runs. Next action Saturday. Lady Eagles go 1-4 in the Franklin Tournament this weekend. District play will resume Tuesday in Milano. Put on your layers and come out and support the girls!! Eagle baseball gets the win this morning, beating Somerville 10-0. Tucker Taylor gets the win on the mound also going 2-2 with a double. Kameron Funburg goes 2-3 with a double and an RBI. Congratulations to Parker Jones for breaking his old school record in the mile and setting a new mark (4.25.21) tonight. Way to go Parker!! First Junior High track meet @ Somervillle tonight is in the books. All the kids ran very hard and gave a lot of effort. So proud of them all!!! Next meet Friday, March 8th in Thrall . Eagle baseball lost today to a very good Veritas Academy team at the Round Top Tournament. Back at it tomorrow morning at 8 am. Good luck Eagles!! Eagle baseball Braves the cold today at the Round-Top Tournament. They lost today and play again tomorrow at 12:10. All field events for the JH track meet in Somerville tomorrow have been canceled. Running will begin at 3:30 with the 2400 meters. Bus leaves school at 1:15. First track meet today in Centerville was a success!! Everyone put forth a great effort. 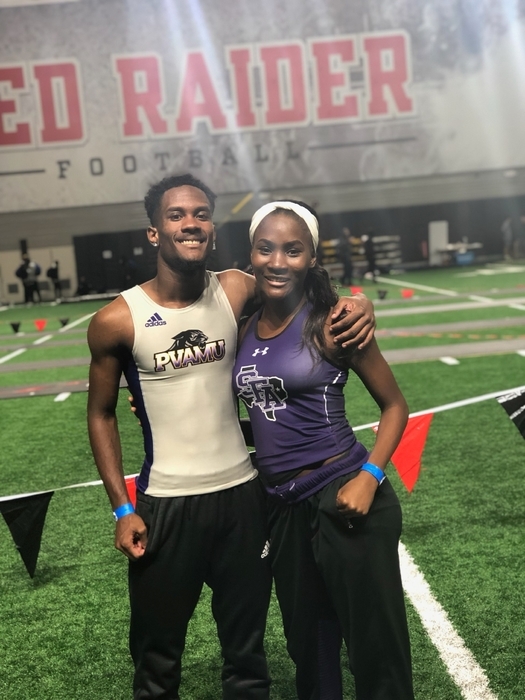 Shout out to Parker Jones who ran a school record in the 800 (2:01) and Devonte Jones who ran a school record in the 200 (22.15). No doubt these marks will fall again before it's over. Lady Eagles post a win in their first district game this afternoon against Bartlett. 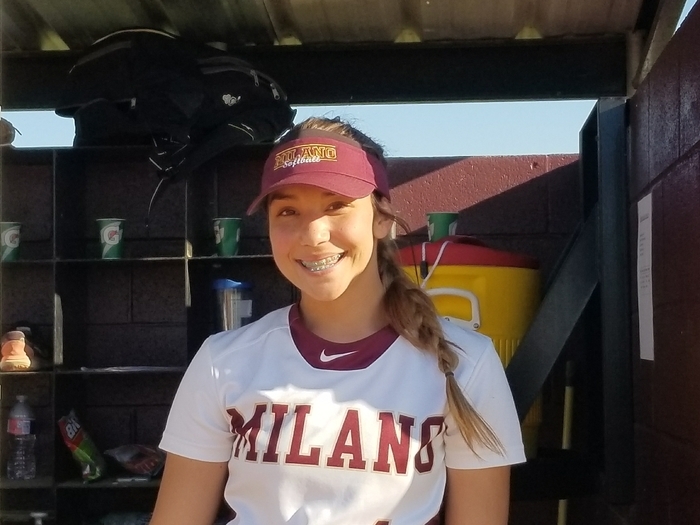 McKenna Robertson hit an in the park homerun. Way to play ladies!! Lady Eagles end 2-3 in the Caldwell Tournament taking a loss today against Caldwell. 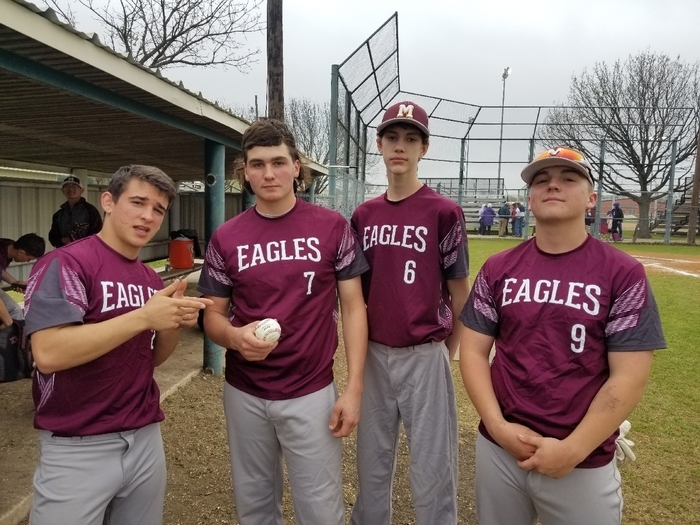 Eagle baseball opens the season today with a loss to St. Joseph in Bryan, 17-7. Lady Eagles even their record at 2 in the Caldwell Softball Tournament. Taking losses to Rogers and Lexington, beating Bellville and Franklin today. Two games scheduled for tomorrow. Milano boys basketball concluded their season last night in Holland. The JV boys won and the varsity lost. 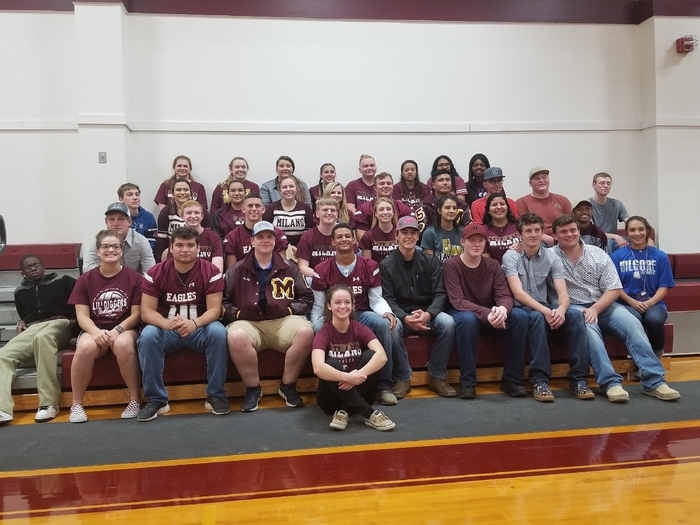 We thank everyone who came out and supported our boys this season and look forward to seeing lots of support at baseball, track, and golf this spring. Go Eagles! Lady Eagle basketball falls to Normangee tonight in a bi-district playoff game @ Caldwell HS. Congratulations on another playoff season and thank you to everyone who came to support the girls tonight and this season. Seniors recognized tonight at Geneva Paceley Gym for their contribution to Milano basketball. Congratulations to these guys and all the team on their win over Thrall on this special night. Eagle basketball falls to a state-ranked Thorndale team tonight. Two district games remain on the boys schedule. Friday will be at home, Tuesday on the road. Come out and support them. The seniors were recognized tonight at their last home basketball game. We appreciate all of these girls and their contribution to Lady Eagle basketball during their years at Milano. Well done ladies!! 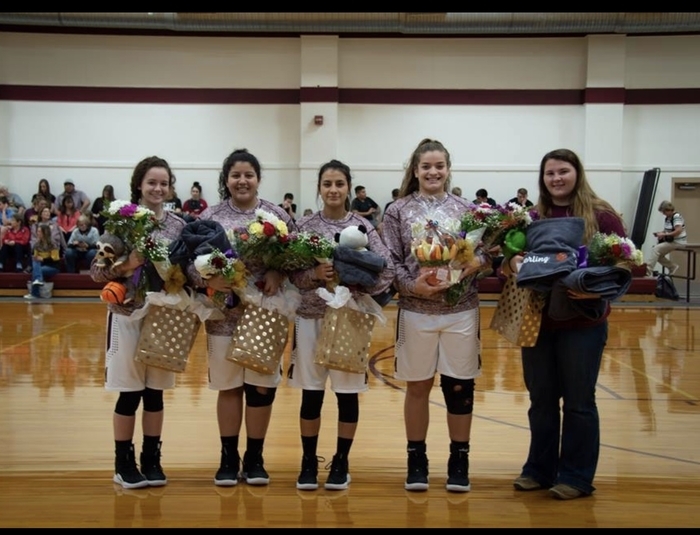 Lady Eagles complete their district season tonight with a loss to Thorndale. They will finish as the 3rd place representative of our district. Playoff information will be released as soon as details are known. Congratulations to Milano 8th grade boys. They were CHAMPIONS today at the Iola Tournament. Way to go Eagles!!! Congratulations to Kathen Funburg. He officially signed today with Birmingham Prep in Birmingham, Alabama to further his football career. This day is a result of Kathen's love and commitment to his sport. We are very proud of him!! Congratulations to Parker Jones. 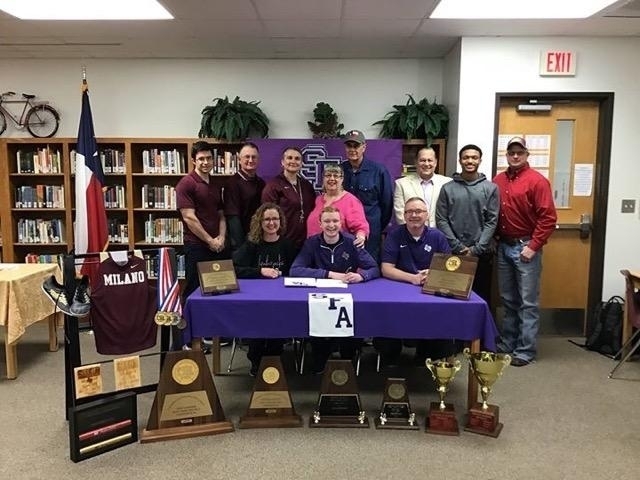 He officially signed to run cross country/track at Stephen F. Austin University in Nacogdoches, Texas. Much hard work and dedication have gone into this day. We are so proud of him!! JV boys come home with a win tonight against Granger. The varsity teams both lost. Next action Friday in Milano. Come support!! Shout out to Parker Jones for volunteering to clean the bleachers after home games this season. 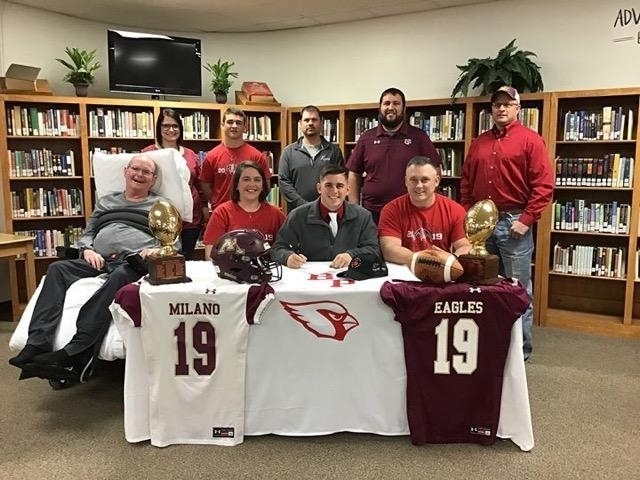 Thank you Parker for your commitment to service at Milano ISD. Texas Tech collegiate meet. 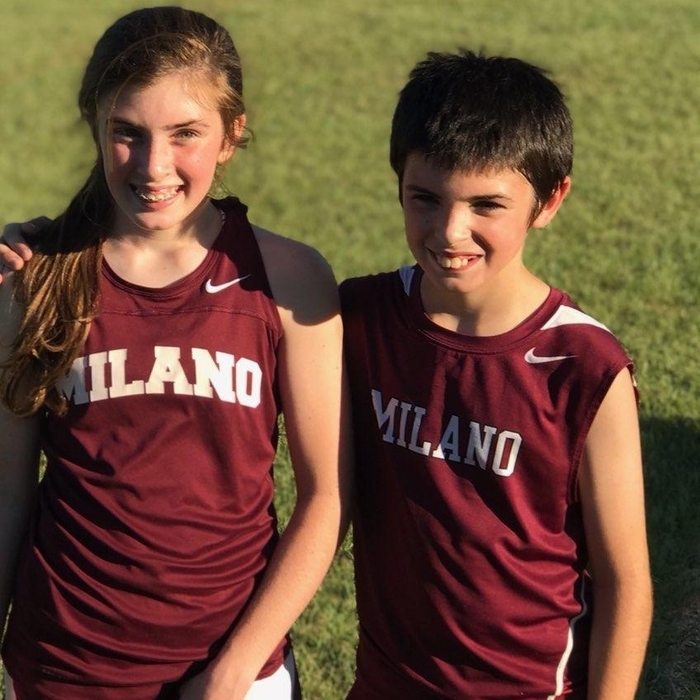 Milano is proud of you both!! Great effort from all Milano Eagle teams tonight vs Holland. The girls earn a big district win. The boys played hard but eventually fell. We are proud of you all. Next action Tuesday, January 22 in Granger. 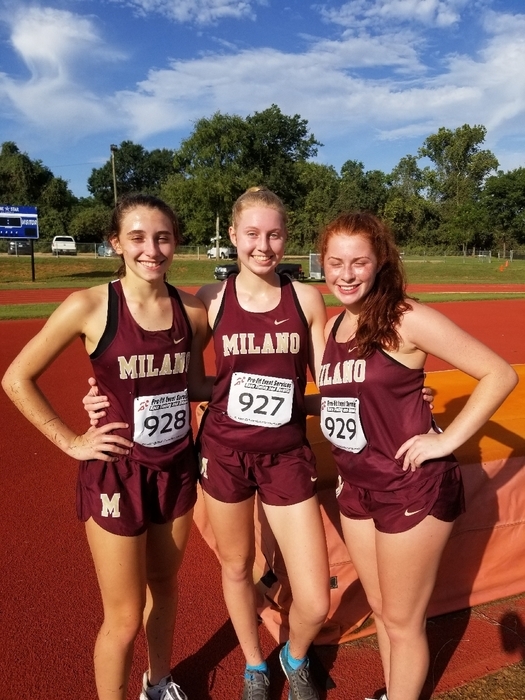 As track season begins, we want to wish all three members of our Milano track family pursuing their talents at the college level a healthy, safe, and successful track season at their respective universities. Corey, Tim, and Camille we wish you all the best!! 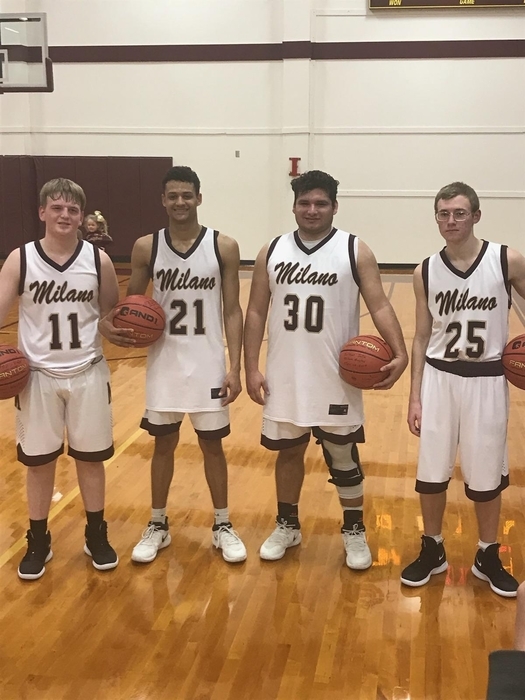 Milano boys basketball wins a close game tonight in Thrall. Way to play guys!! Best of luck to Milano track alum, Tim Demeritt and Camille Messer. 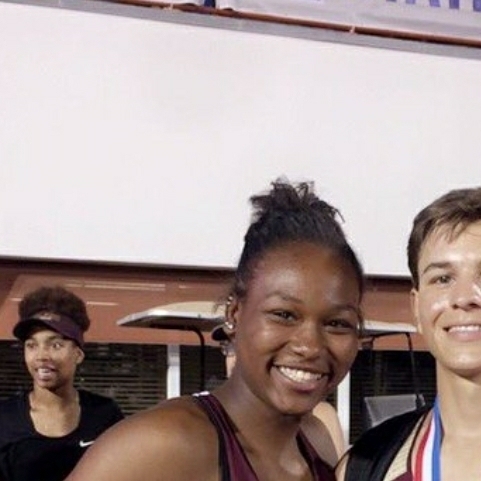 Both compete this weekend at TAMU indoor meet for their respective colleges. Best of luck to both!!! We are very proud of you. Lady Eagles post a big district win last night against Hearne. Way to go ladies!! Lady Eagles take the district win in Mumford tonight. The boys played hard but came up short. Have a restful holiday season!! Milano boys and girls varsity basketball teams earn a pair of wins tonight over Granger. Next game in Mumford Friday at 2pm. Come support. Milano varsity boys fall tonight to Lexington. District play starts for the boys next Tuesday, December 18. Lady Eagles move to 1-1 in district play tonight with a win over Holland. Way to play ladies!! Congratulations to both boys and girls Varsity basketball teams tonight for wins over Somerville and Caldwell. Way to go Eagles!! Varsity basketball Lady Eagles go 2-0 in the Cameron Tournament today. JV has their first action going 0-2. Varsity Eagle football ended the season with a loss to Mason in the bi-district round last night. Thank you Eagles for a fun season!! 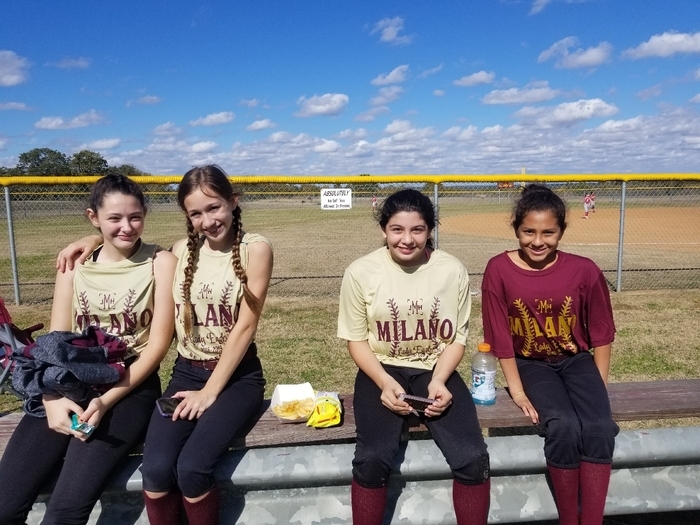 Enjoying a beautiful day of JH softball in Milano today. Lady Eagle basketball goes 1-1 in the Cameron Tournament today beating Cameron and losing to Rockdale. Senior pep rally was a success tonight!! Many great memories remembered and made tonight. 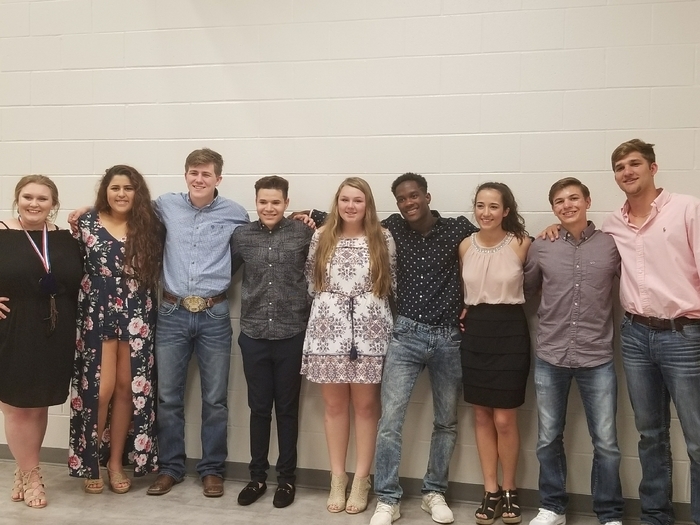 Great job Class of 2019!! Some of the JH football Eagles at the pep rally tonight after their victory tonight over Holland 22-16. Great end to a great season!! 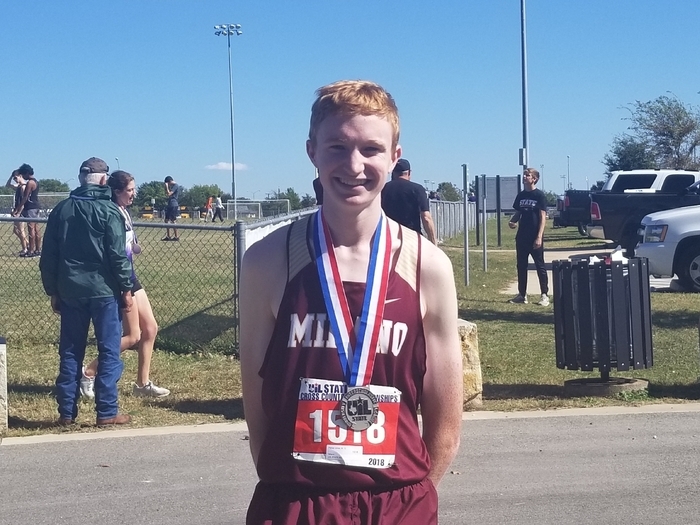 PARKER JONES 2nd in TX at the boys 2A State XC Meet this morning. What a great result for a young man that has worked so hard. Well done!! Congrats JENNA LEWIS!!! Jenna and her parents traveled to Kilgore College for a signing. Jenna will be playing softball for the Rangers!! Varsity Eagle football wins at Rosebud Lott tonight securing a playoff spot. 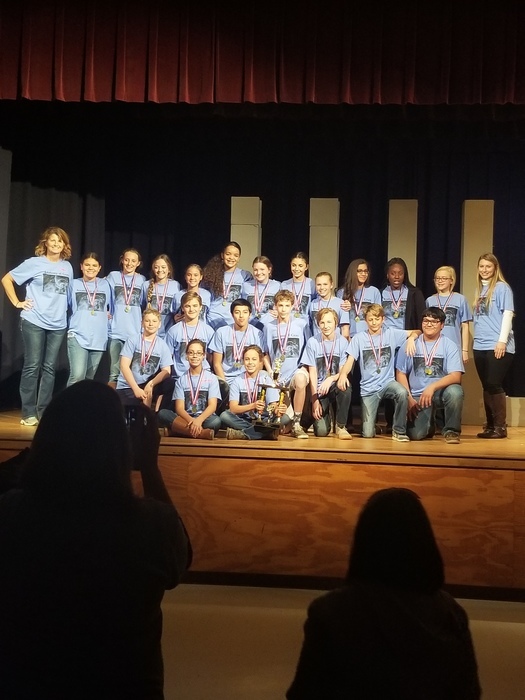 Way to go team!! JH football loses a close 7-0 game to Rosebud Lott tonight. Last game next week in Holland. Lady Eagles season comes to an end tonight losing to Snook in the bi-district round. The girls finish a 22-13 season. Great season girls!! Varsity football earns a win at home tonight against Marlin. District record goes to 2-2 with Rosebud-Lott next week. JH football loses to Marlin tonight 28-6. Eagles back in action next week against Rosebud Lott. 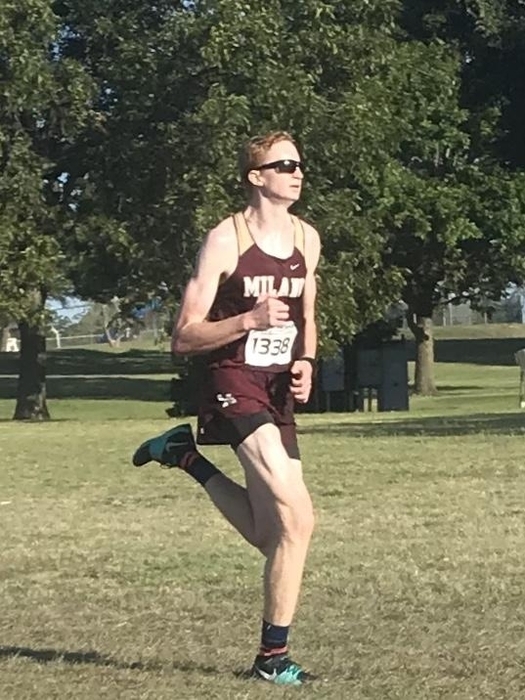 Congratulations PARKER JONES, Region IV-2A boys champion in cross country. On to STATE!! 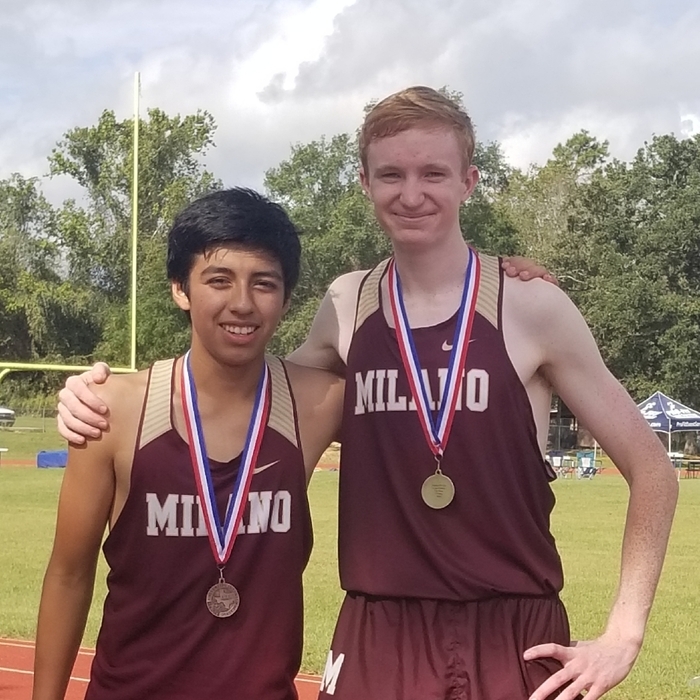 GOOD LUCK to Parker Jones and Andy Gutierrez representing MHS today at the Region IV-2A Regional XC Meet in Corpus. 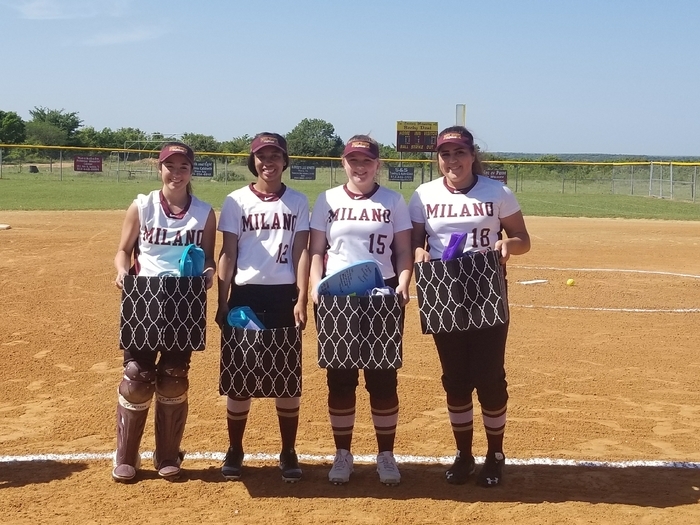 Lady Eagles take the win today on Senior day vs Bartlett. The girls complete district play 10-4, finishing 3rd and making the playoffs. Senior day at the volleyball game today. Love these two then and now. From 7th grade to senior year. Thank you girls for your dedication. Volleyball playoff tshirts will be ordered Tuesday morning, October 23rd. Please text Wendy King or contact a varsity vb player to order. Eagle varsity football battled tonight in very sloppy weather @ Bulldog Stadium but came up short vs Thorndale to go to 1- 2 in district. 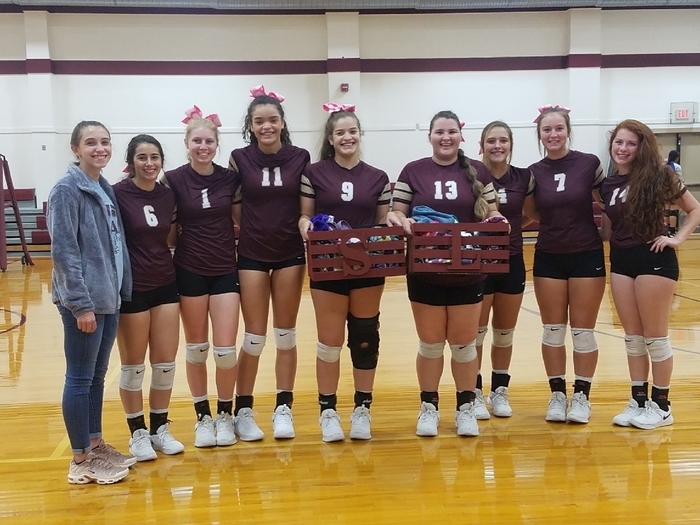 Lady Eagle volleyball takes a loss tonight in Thorndale to move to 9-4 in district play. JH girls finished the volleyball season tonight in Holland. 7th grade won. 8th grade won a set but lost the game. Good season ladies. Seniors and Senior Parents: A reminder that tonight is senior information night. "Come rain or shine"
Lady Eagle varsity goes to 9-3 beating Granger. Kenna and Sterling combined for 24 kills. Laynie and Abby O combine for 25 digs. Lady Eagle JV take the win today over Granger coming back from a first game loss, 20-25 25-23 25-11. Great team effort today girls!! Sometimes a score doesn't tell the whole story. 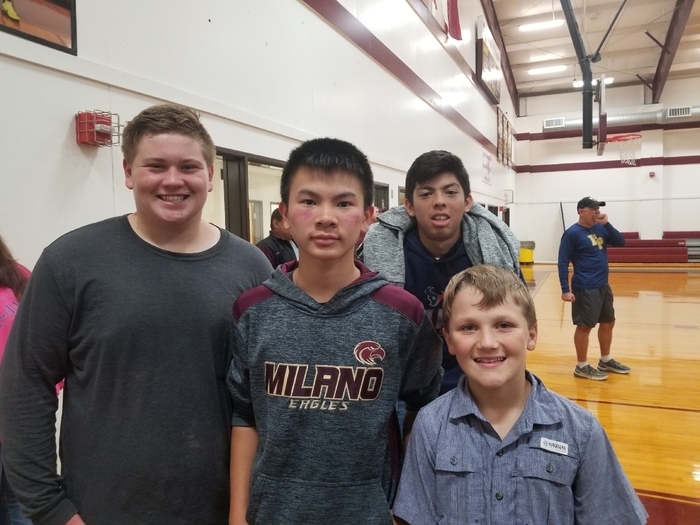 The Milano Eagles made us all proud tonight in a hard fought 21-27 loss to Hearne. All ready for HOMECOMING!! 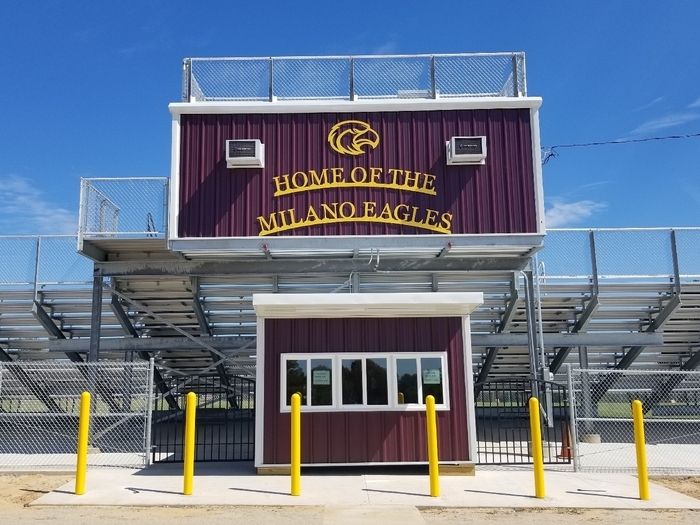 A big thank you to Milano alum Bryan Graham and Tracy Love for making our stadium entrance look so fantastic. 7th grade volleyball team defeats Bartlett tonight. 8th grade falls to Bartlett. Last game Monday in Holland. Junior High football defeats Hearne tonight 30-14 for another district win. Great game guys!! JH district XC meet today. Kadance Koenig is the district CHAMPION and Wyatt Koenig finished 6th. Way to go guys, thanks for a great season! Lady Eagle volleyball comes from behind in game 4 to beat Mumford moving them to 8-3 in district play. Mr. Jentsch's Ag. class made these beautiful flag frames. HS district XC today. Parker Jones 1st, Andy Gutierrez 6th, and Danni Shaw 8th qualifying for regionals in Corpus. Great season for all!! Lady Eagle volleyball loses to Thrall to move to 9-3 in district play. Next game in Mumford, Tuesday October 9. Junior High Football wins again tonight to take their record to 3-0. Good job boys!! Lady Eagle volleyball defeats Buckholts this afternoon taking them to 7-2 in district play. Senior Information Night on October 15th at 6:30 p.m. in the high school library. Lady Eagles take the win in Holland today in 4 sets. Abby Miller came through with tough serves. Danni and McKenna combined for 8 blocks. 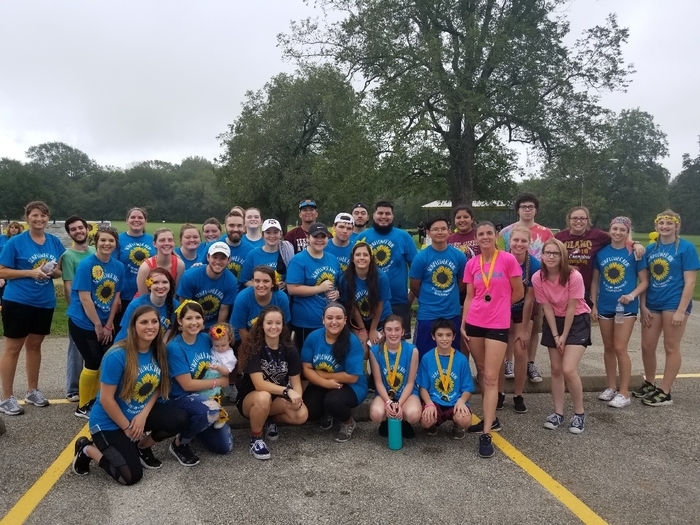 A great morning at the Melodie Jones Sunflower Run!!! Fun and fellowship in honor of a very special young lady. Eagle varsity football gets the win tonight over Thrall 14-13. Danny Cloud and Kevin Garcia turned in strong defensive efforts. Junior high football earns the district win tonight over Thrall. JV and varsity volleyball get wins tonight in Bartlett. Varsity record 5-2 through the first half of district sitting in 3rd place. Parker Jones finishes 8th this morning in the Hillacious Brenham Invitational. Parker was 8th of 366 runners, mostly 5A/6A schools. Lady Eagles lose in 4 sets today to Thorndale. Next match will be in Bartlett Tuesday @5. Varsity football vs Iola tonight was cancelled due to persistent lightning. Eagle JH Football team wins their first game tonight in Iola 30-0. Great start to the season boys!! JV girls volleyball earn their first district win tonight in Granger. Good job girls!! Lady Eagles go 4-1 in district beating Granger tonight. Abby Miller served great with 4 aces and Sterling led with 11 kills, 8 digs. Lady Eagle volleyball goes 3-1 in district play with a win this afternoon over Mumford. McKenna Robertson comes through with 17 kills. Parker Jones and Kadance Koenig each take 1st place in their divisions at the Jarrell XC meet this morning. Way to run guys!!! 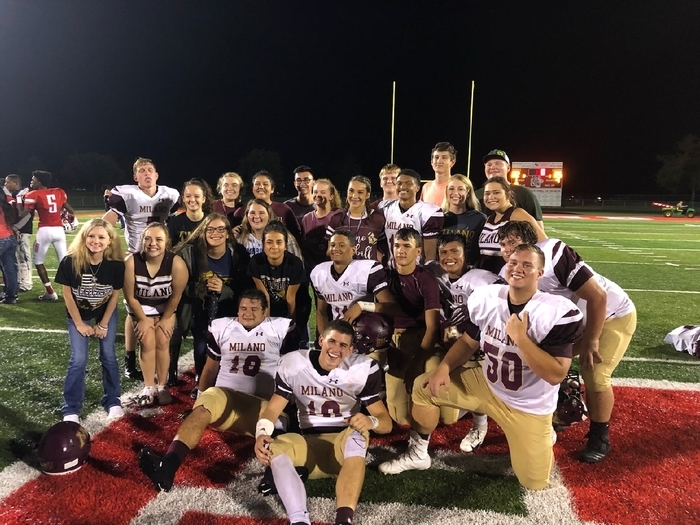 MHS seniors celebrate Eagle football's win tonight over Bremond 25-22. The JH football game in Milano this afternoon has been cancelled due to rain. JH football tonight in Milano vs Bremond. Game time is 5:30. Volleyball loses to Thrall tonight in 3 hard fought games. The girls played their best game of the season and competed at a high level. From the weekend, XC ran at the Lexington Inv. Andy Gutierrez 9th, Cinch Pilkey 32, Abby Miller 23, Danni Shaw 39, Angela Zeig 48. From the weekend, Milano volleyball sweeps Buckholts in district play bringing their district record to 2-0. From the weekend, Milano football gives Burton a tough fight in the first half but eventually fall 47-16. From the weekend, Parker Jones placed 5th in the 5A/6A division of the Tyler Lee Classic CC meet hosted @ UT Tyler. Volleyball in Milano today vs. Thrall. JV starts at 5:00. Lady Eagles volleyball beat Holland in 3 to start district play. Next match is in Buckholts, Saturday at 1pm. 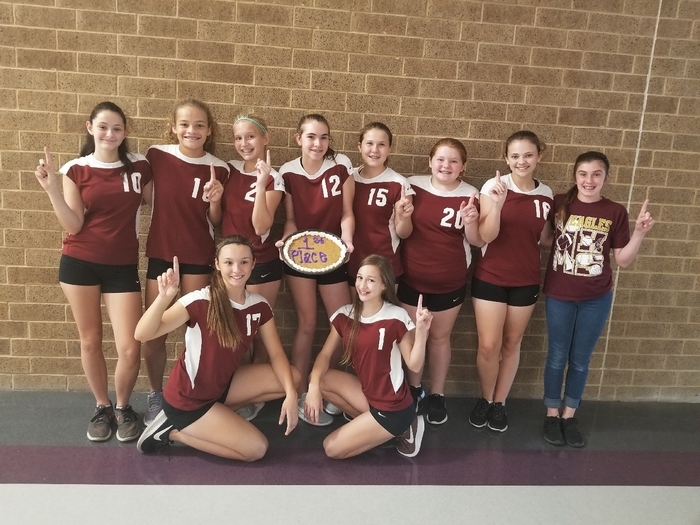 7th grade girls volleyball team CHAMPIONS @ Thrall Tournament today. Great day ladies!!! Abby Miller, Danni Shaw, and Angela Zeig competed in the 1A-4A girls division at the cc meet today finishing 74th , 84th , and 107th. Andy Gutierrez and Cinch Pilkey competed in the 1A-4A boys division of the Pro-Fit Invitational and finished 43rd and 111th. Good run!! Parker Jones finished 2nd today in the 5A-6A division of the Pro-Fit Invitational with a time of 16:01. Excellent run young man!! Letterman jackets will be handed out at this weeks pep rally. The pep rally will be in the HS gym @ 3:00. 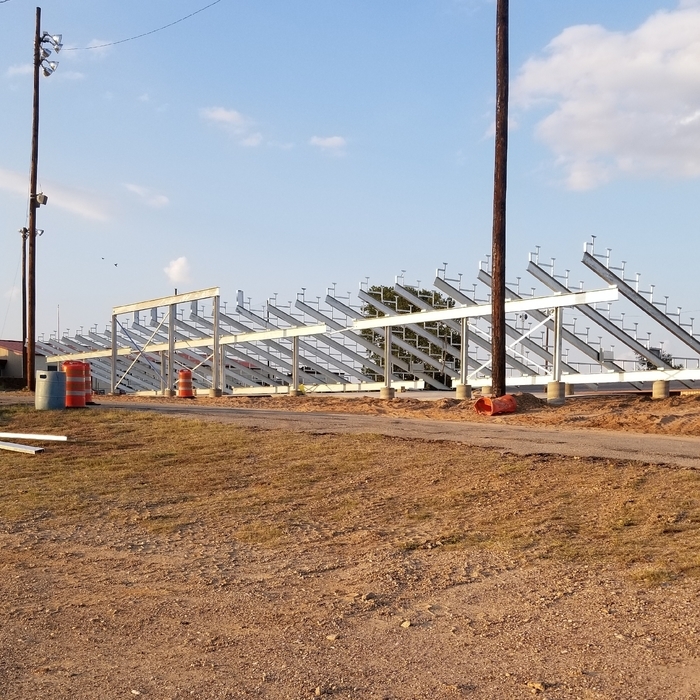 New home side bleachers going up at Milano High School!! Exciting times!! Varsity volleyball goes 1-1 in Anderson Shiro Tournament today. Varsity volleyball beats Bremond tonight in 5 hard fought games. Good win girls!! Running in the Belton CC meet in the 1A-4A girls division, Abby Miller 73rd, Danni Shaw 97th, Angela Zeig 98th. Good run girls!! Running in the Belton CC meet, 1A-4A division was Andy Gutierrez 39th and Cinch Pilkey 94th. Good run guys!! Congratulations to Parker Jones finishing 3rd in the 5A and 6A boys division of the Belton Invitational!! Way to go Parker!! 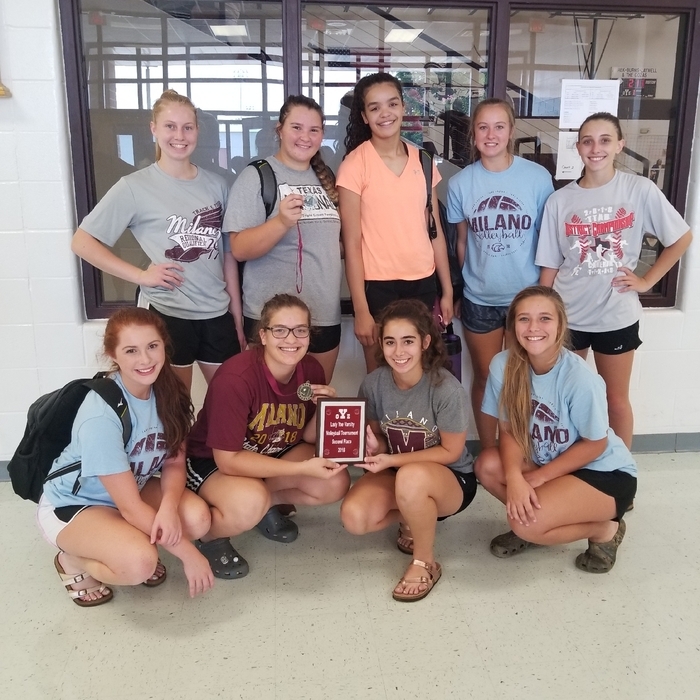 Varsity volleyball team 1-2 today in Anderson-Shiro Tournament. Good win against Franklin. Home tomorrow @ 4 vs Bremond. V only. 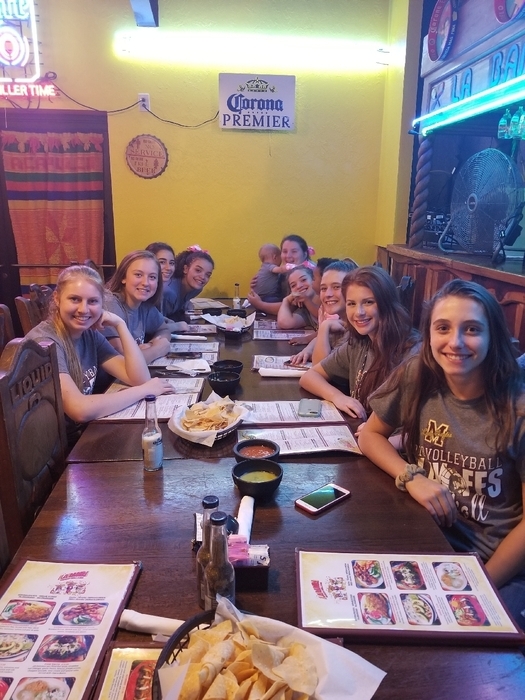 Varsity volleyball went 2-1 in today's action at the Bruceville-Eddy Tournament. Headed back tomorrow for bracket play. A sincere THANK YOU to everyone who donated items and bought items making 2018 the most successful Meet the Eagles ever!! Lady Eagles JV and Varsity volleyball teams take wins tonight over Brazos Christian. Way to play ladies!! Meet the Eagles, Thur. Aug 16 @7:00. We look forward to ALL senior athletes participating in the live cake auction. W. King for more info. August 16th: Meet the Teachers @ 6pm Meet the Eagles @ 7pm in HS Gym Any senior athlete who wants to participate in the cake auction is welcome. Congratulations Laynie and Sterling for being chosen all-tournament at the Cameron Tournament. Lady Eagles take 2nd place at the Cameron Tournament. Way to go ladies!! MISD is accepting applications for substitute teachers. Sub training is 8/14/18 in the HS computer lab at 9:00am. We are using the AESOP/Frontline system this year. 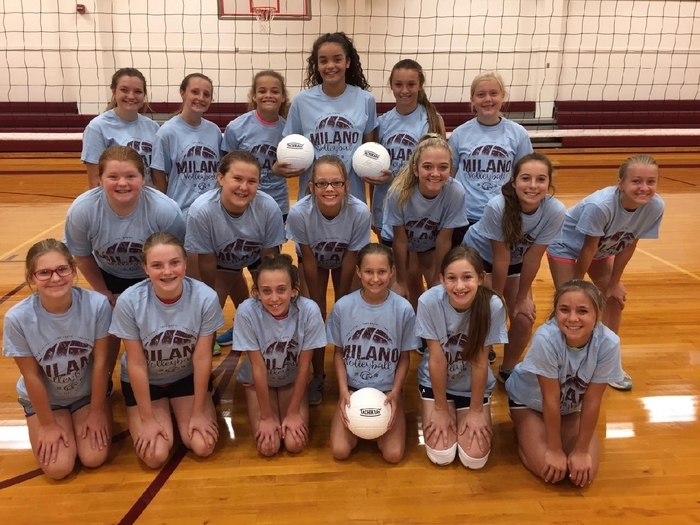 We had a great time at volleyball camp this week!! First day of high school football practice is August 6 @ 7 am. All athletes must have a sports physical on file to participate. Congratulations Milano Wolfpack!!! 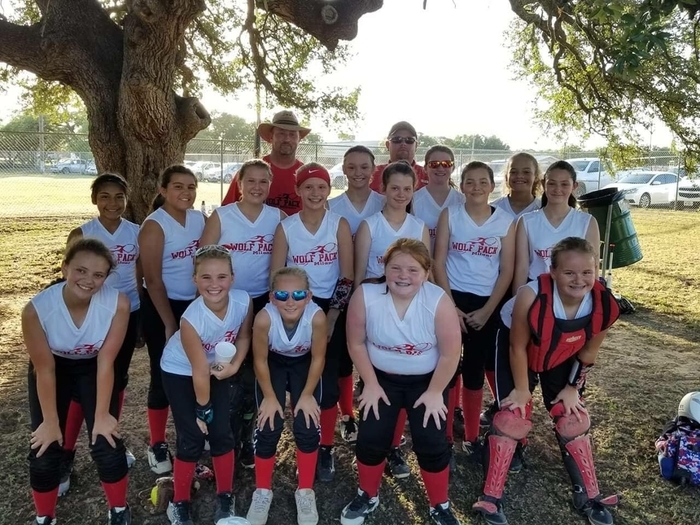 These girls have qualified for the state tournament in softball. Way to go ladies!! 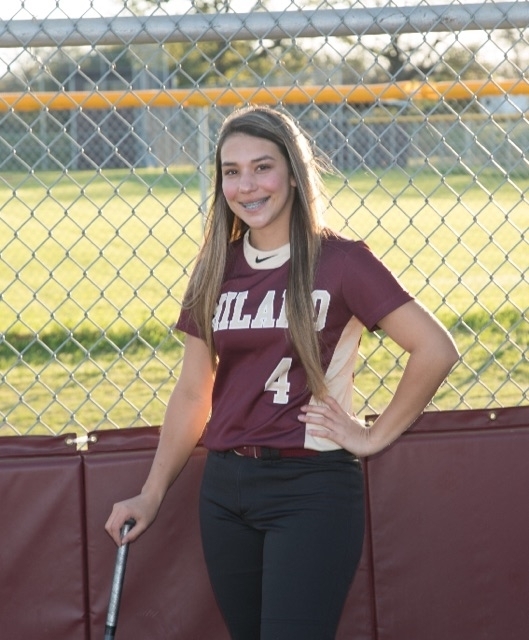 Congratulations to Lady Eagles pitcher, Jenna Lewis who has been named to the Texas Girls Coaches Association All-State softball team!!! Reorders of State Track Shirts are in and available for pick up at the Milano High School office. The weightroom will be closed May 28-June 1. Summer workout time will begin Monday, June 4. Check the website this week for times. Enough interest has been expressed that a second order of track shirts will be placed. Order forms are available in the high school office. Track shirts are in. Shirts will be available for pick up in the high school office Thursday and Friday, May 24 and 25. Final Reminder: State Track Champion tshirt orders are due, with money, Monday May 21. The order will be placed at 1:30 PM. Remember STATE TRACK CHAMPION tshirt order forms/money are due Monday, May 21. For those who have asked, names will be on back. 2018 STATE TRACK CHAMPION t-shirts are on sale. Order forms can be found in the high school office. Orders with money are due by May 21. 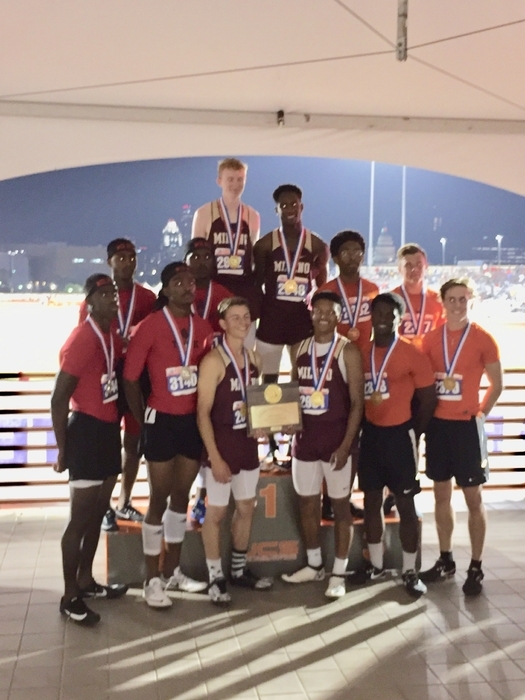 The track team and coaches want to send out a sincere THANK YOU to everyone who came to Austin to cheer us on and help make history!! Don't forget Sports Banquet tomorrow night with meal served at 6pm and program starting at 7pm. Athletes bring the dessert of your choice. Very proud of Trenieceisa Mitchell. She represented Milano in the girls 100 meters at the STATE track meet tonight. Great season LULU!! Mr. W'brook with his STATE Championship team. Well deserved Sir. Many years of hard work and dedication culminating in a dream come true!! 4 x 400 meter relay STATE CHAMPIONS!!! 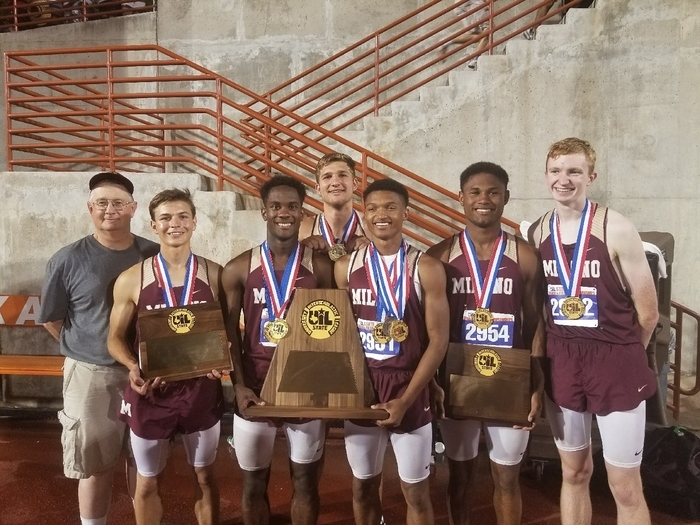 MILANO EAGLES 2018 BOYS CLASS 2A TRACK AND FIELD CHAMPIONS!!!!! OMG!!! 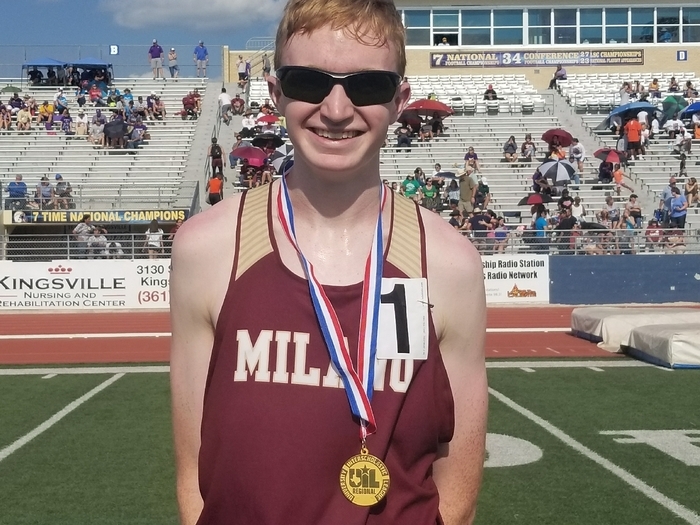 Parker Jones 1600 meter STATE CHAMPION!!! Way to run Parker!!! Devonte Jones wins the silver medal at the STATE track meet in the boys 2A 300 meter hurdles. Great performance Devonte!! 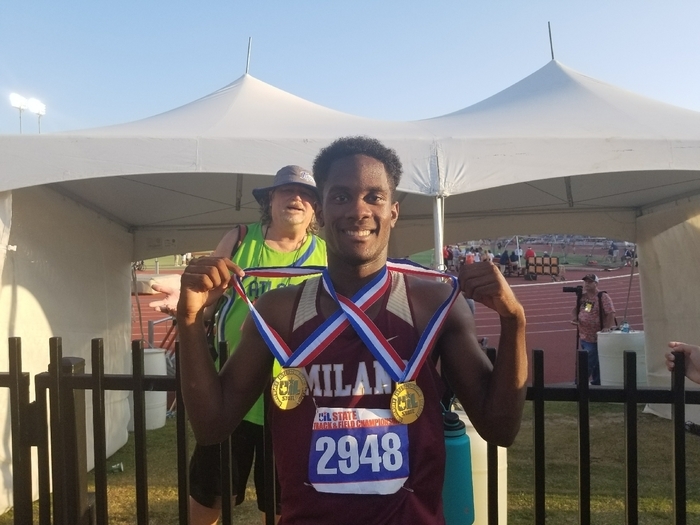 Class 2A 400 meter STATE CHAMPION!!! Way to run Tim!!! 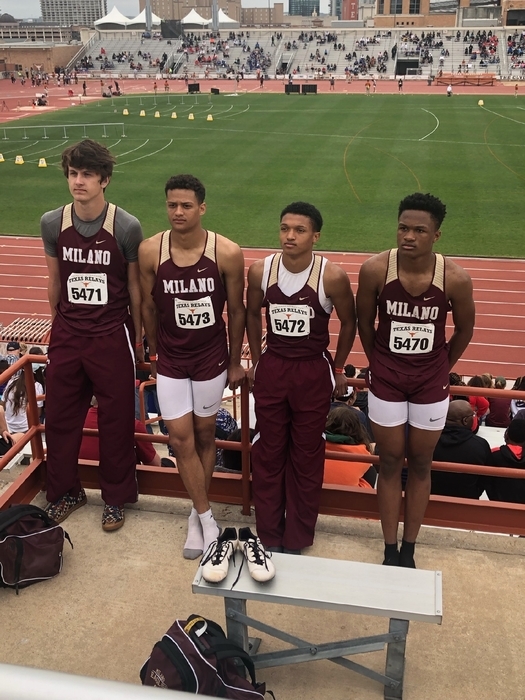 I am so excited I neglected to mention.... Class 2A 4 x 100 meter STATE CHAMPIONS!!!! 4 x 100 meter relay CHAMPIONS!!! Devonte Jones finishes third in the STATE in boys long jump this morning!!!!! What a great start to a long day!!! GO EAGLES!!! State Track tomorrow @ Austin. MHS has 7 events on the schedule starting w/long jump at 8am. Come support if you can, if not check updates. Athletic Banquet Monday, May 14. Serving will begin at 6pm and the program at 7pm. Plates are $10 at the door, athletes free. Tomorrow, May 9, the athletic department will be providing pizza at lunch for all students grades 6 -8 who completed a sport this year. 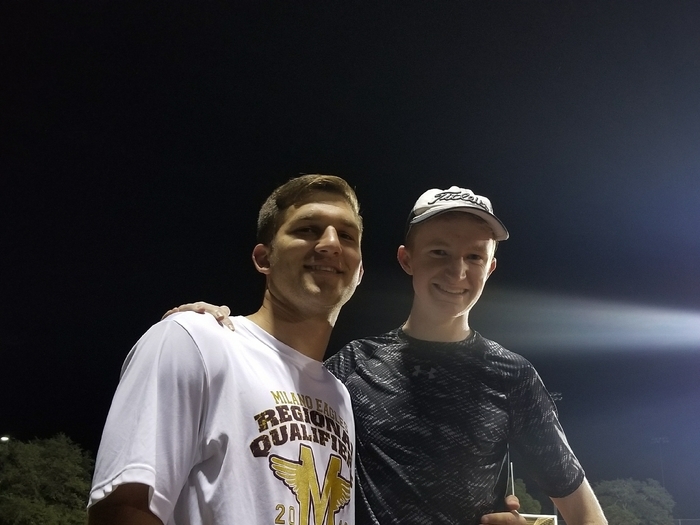 The record broken by Parker on Saturday was MHS longest standing track record set by Joe Hendrix in 1967. Tremendous effort then and now!! Parker Jones breaks the school record in the mile tonight running in a state meet tune up in Leander. 4:26.55... Way to go Parker!!! Lady Eagles fall to Normangee tonight in the Area round of softball, 0-1. It was a great season. Way to battle ladies. 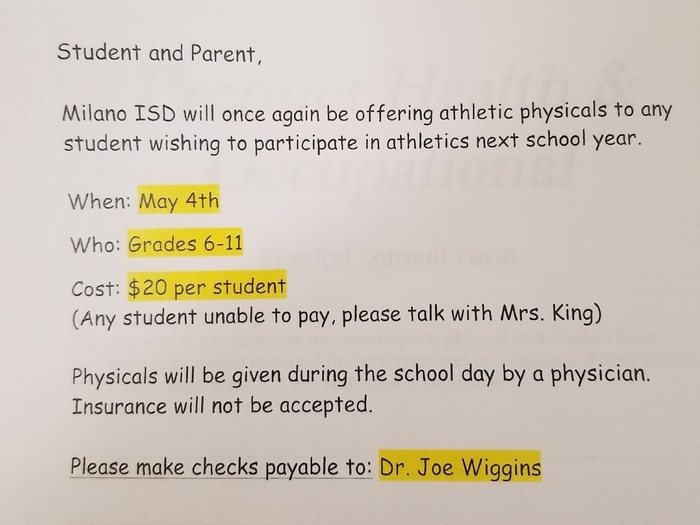 REMINDER: Athletic PHYSICALS for the 2018-19 school year are being given at school this Friday, May 4th. Forms have been sent home. 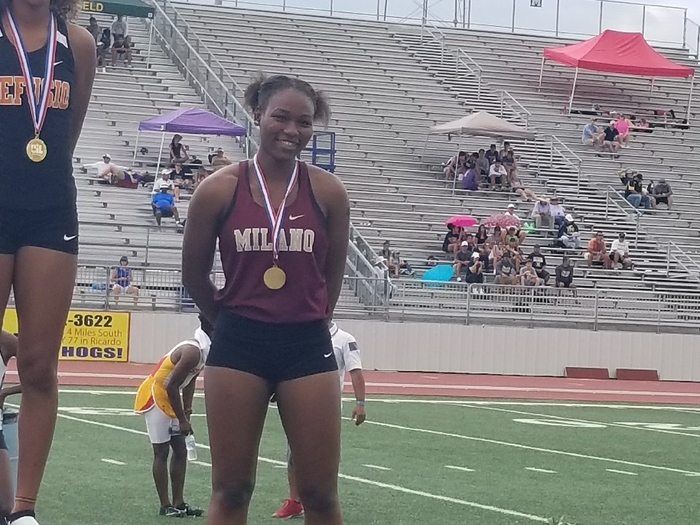 Kalie represented Milano in the girls discus competition today at the Regional track meet. Great season Kalie!!! 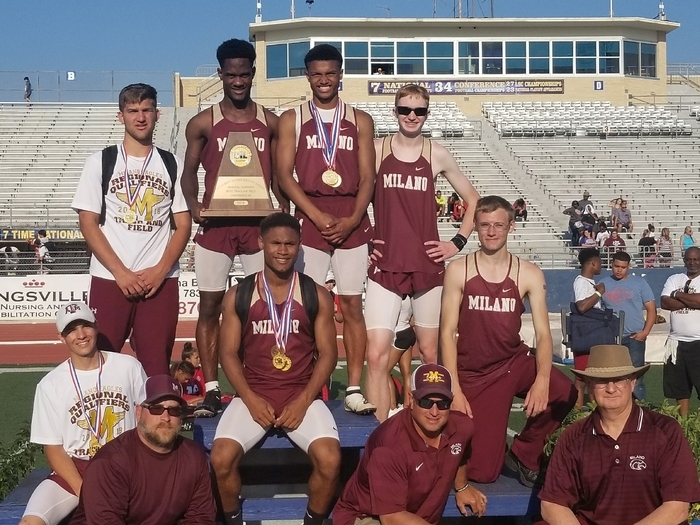 Back to Back REGION IV 2A Track Champions!!! A great big shout out to Trebeaux and Gus for working so hard this weekend at the Regional track meet. 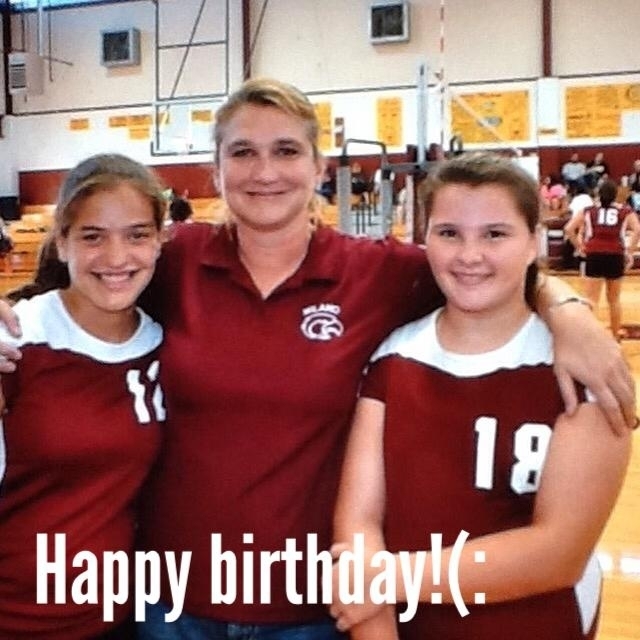 You both are greatly appreciated! 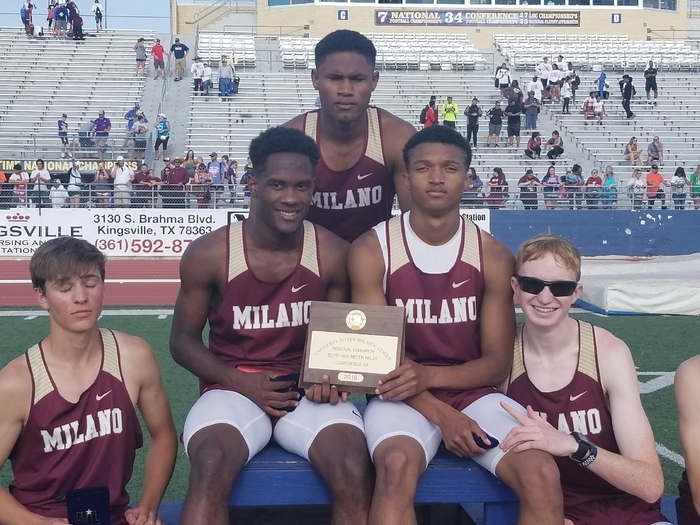 Region IV 2A, 4 x 400m relay CHAMPIONS. Parker, Kaleb, Devonte, Ronnie, and Tim. They will run at the STATE MEET in Austin. Great effort!! Parker Jones boys 1600m Regional CHAMPION, qualifying him for the STATE meet. Way to go Parker!! Abby Miller competed in the 1600m today at the Regional meet. Great season Abby!! Kelaria finished 5th and Trenieceisa 6th in the 200m at the Regional track meet today. Way to go and great season girls!! 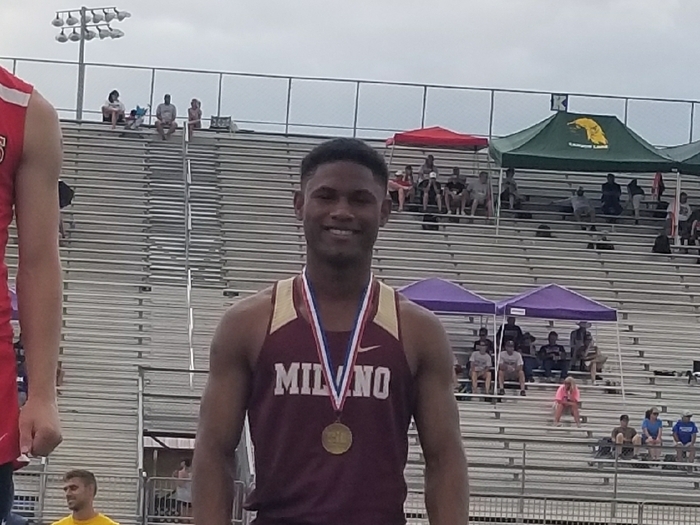 Devonte Jones Regional CHAMPION 300m hurdles, earning a trip to STATE. Way to go Devonte!!! Tim Demeritt boys 400m CHAMPION!!! Tim earned a trip to state. Way to go Tim!!! Ronnie Messer finishes 3rd in the boys 100m. Great job Ronnie!! Trenieceisa Mitchell places 3rd in the 100m and Kelaria King finishes 5th. Great season girls!!! Emma and Abby competed in the 800 m run at the Regional meet today. Emma placed 4th. Both girls competed hard and had an excellent season! 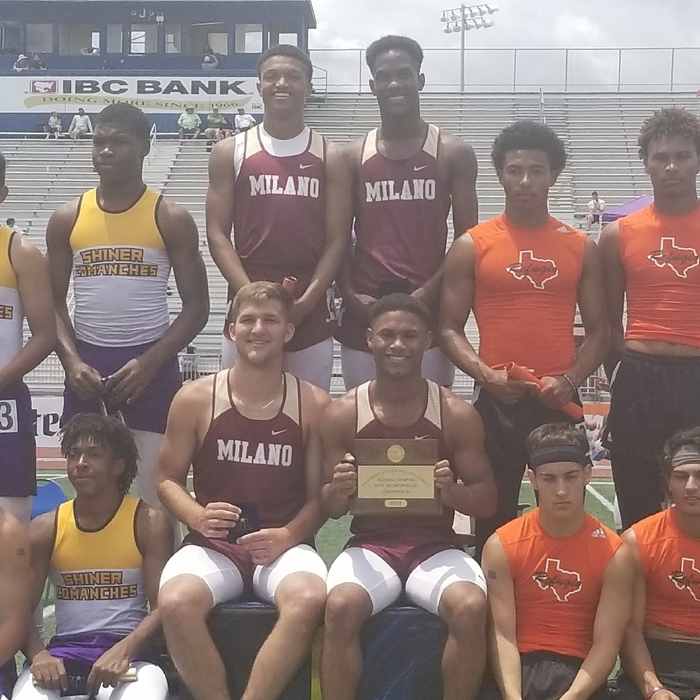 Regional 4 x 100 relay CHAMPIONS!!! Ronnie, Tim, Kyle, Devonte advancing to the STATE MEET. Great effort boys!!! 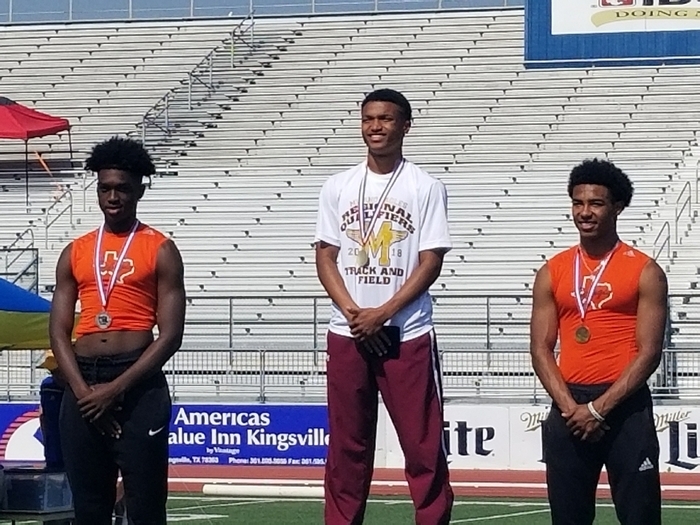 Devonte Jones, Region IV 2A boys long jump CHAMPION qualifying him for the STATE MEET. Way to start the day Devonte!!! 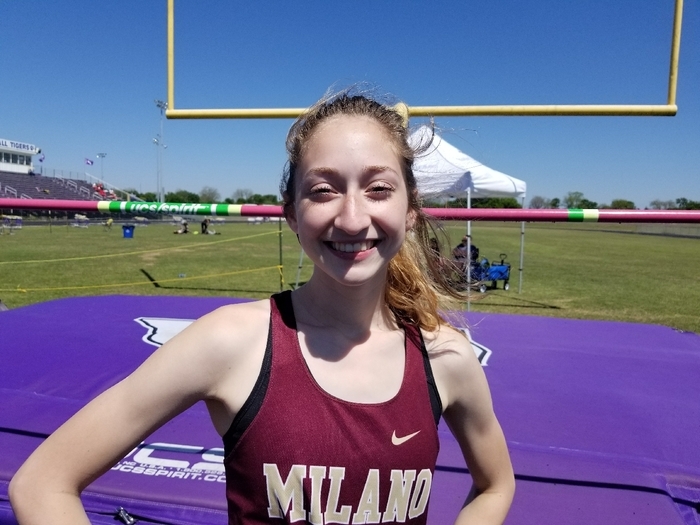 Jaden Carmichael represented Milano today in the high jump at the Regional track meet. What a great experience for a freshman. Great season! First day at Regional track was a success. Everyone who competed today qualified for the final tomorrow. Tune in tomorrow for results. 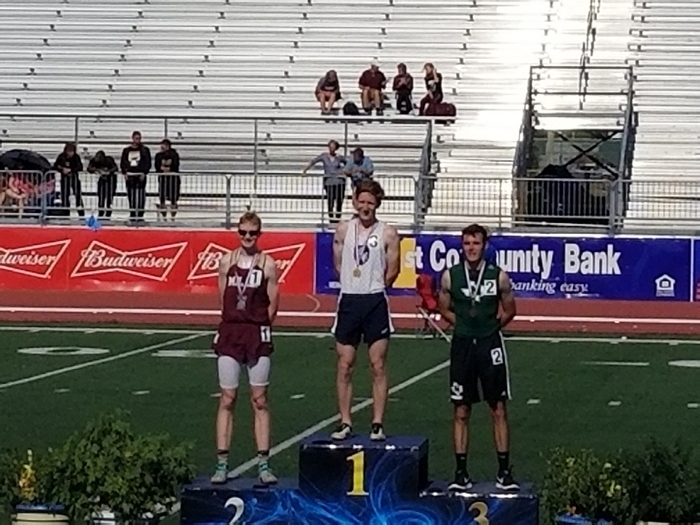 Parker Jones qualifies for STATE, finishing second in the 3200 m run. Way to go Parker!!!! 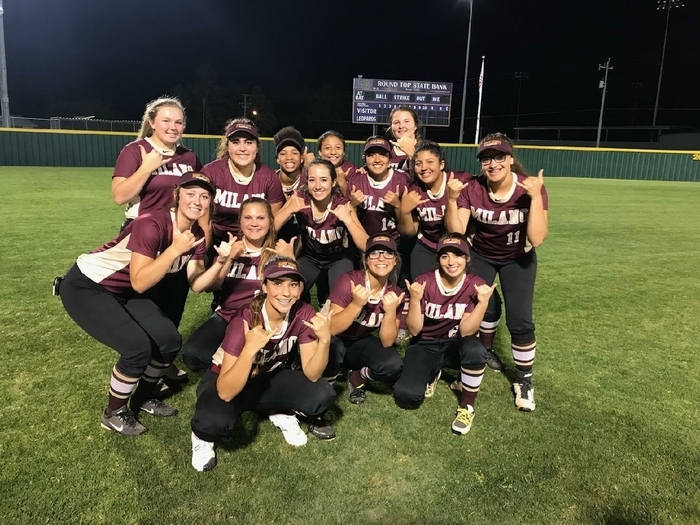 Lady Eagles win bi-district game vs Flatonia tonight, 11-2. Good job ladies. Great win!!! Sterling Robertson hits a 2 run homerun in the Lady Eagles bi-district win tonight. Way to go Sterling!!! 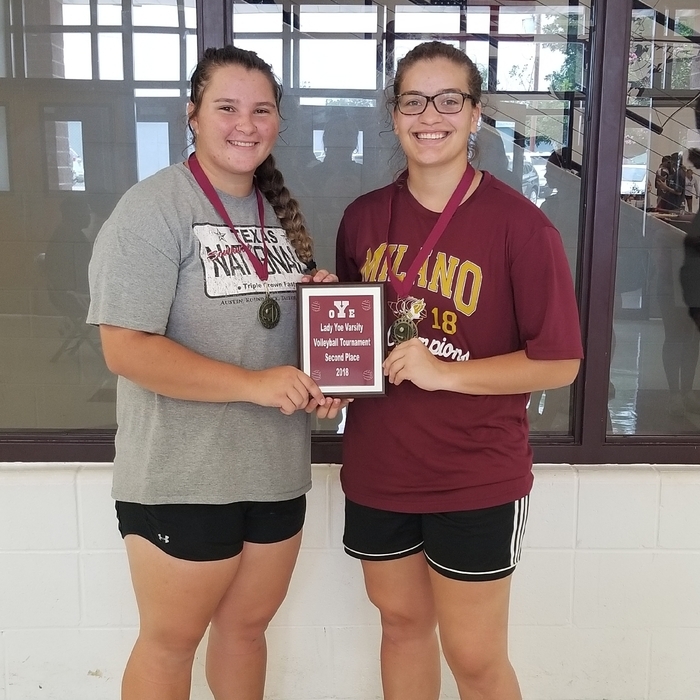 Congratulations Faith and Mary, representing Milano at Regional golf this week. Faith shooting a PR today of 104!! Great season ladies!! 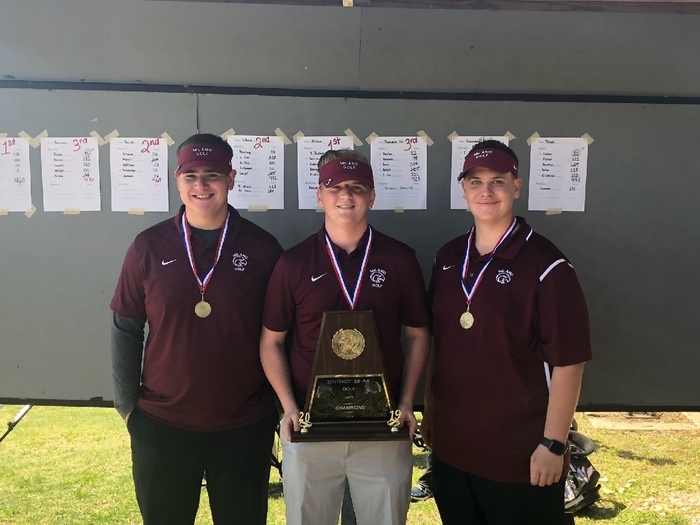 Congratulations Kaleb Dodd who finished 9th at the Regional golf tournament shooting 87 and 85 for a 2 day total of 172. Way to go Kaleb!!! Blinn College will have their information trailer on site Monday, April 30th. Come by between 3:30pm and 6:30pm to talk and get information. Boys golf 6th after day 1 of Regional competition led by Kaleb Dodd's round of 87, followed by Mason, Coby, and Tucker all shooting 101. Lady Eagles in Rockdale tonight for a warm up. The game ends after 7 innings in a tie, 1-1. Eagle baseball falls to Bartlett 10-1. Senior Cody Starkey goes 2-3 on the night with a run scored. Nate Gray with an RBI. Good luck and safe travels to the golf team as they travel to Corpus tomorrow to compete at the Regional golf tournament!!! Softball bi-district playoff game Thursday, April 26 vs Flatonia @ Lagrange 7pm. Come out and support our Lady Eagles!! Softball warm up game vs Rockdale @ Rockdale, April 24 at 6:00 pm. Lady Eagle softball wins last regular season game tonight in Rosebud Lott,14-0. Kalie Poehl hits her 7th home run this season. Cody Starkey, the lone senior on our baseball team this season, played his last home game this afternoon. Thank you Cody for a great season. Eagle baseball takes the loss to Bartlett tonight 12-0. Next action Tuesday, April 24 @Bartlett 4:30pm. 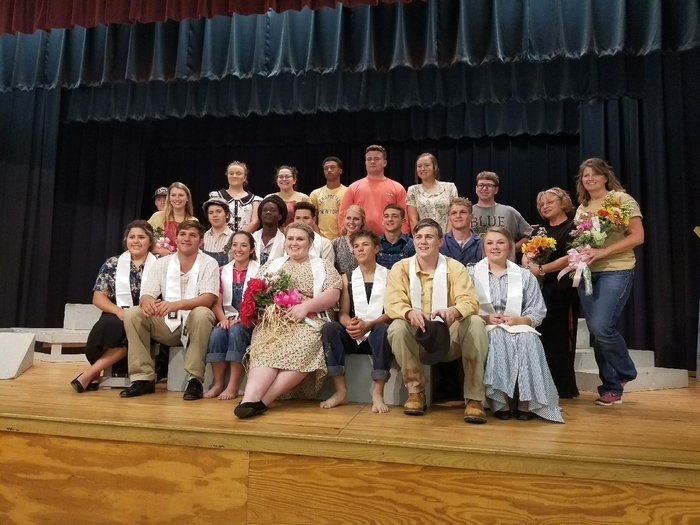 Lessons learned, friendships created, talents discovered... Milano OAP performed one last time this evening ending their season. Great show! Eagle baseball takes the win over Rosebud Lott 8-5 behind Marcos Ruelas homerun and a complete game by Danny Cloud. Kali Taylor hits a two run home run this afternoon to secure the victory for Lady Eagle softball. What a way to end her last home game!! Lady Eagles win vs Thrall 5-2. Next action Friday @ Rosebud Lott 6:30 pm. Seniors last home game today. Go Lady Eagles!!! Boys AREA champions!!! Great day guys. Parker Jones wins the 1600 m run and Chris Sootoo places 3rd qualifying both for Regionals. Abby Miller places 4th in the 1600 m run, qualifying her for Regionals in 2 events. 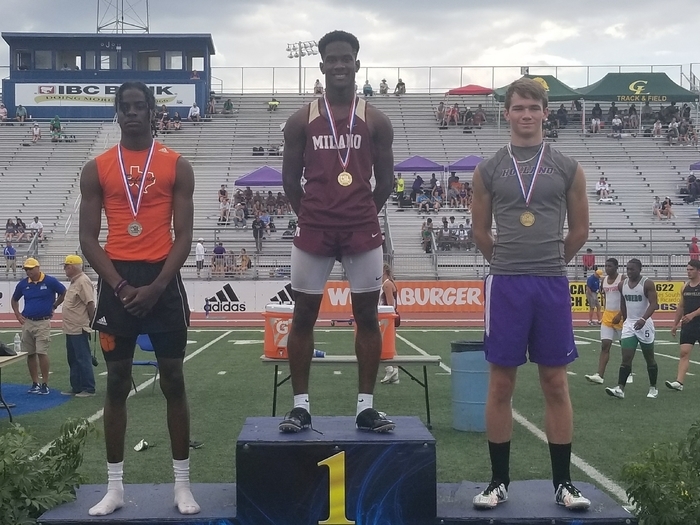 Kelaria King and Lulu Mitchell qualify for Regionals placing 3rd and 4th in the girls 200 m.
Devonte Jones wins the 300 m hurdles, qualifying him for Regionals. Tim Demeritt wins the 400 meters, qualifying for Regionals. Emma Batten 4th in the 400 ., qualifying for Regionals. Ronnie Messer wins the boys 100 m, qualifying for Regionals. 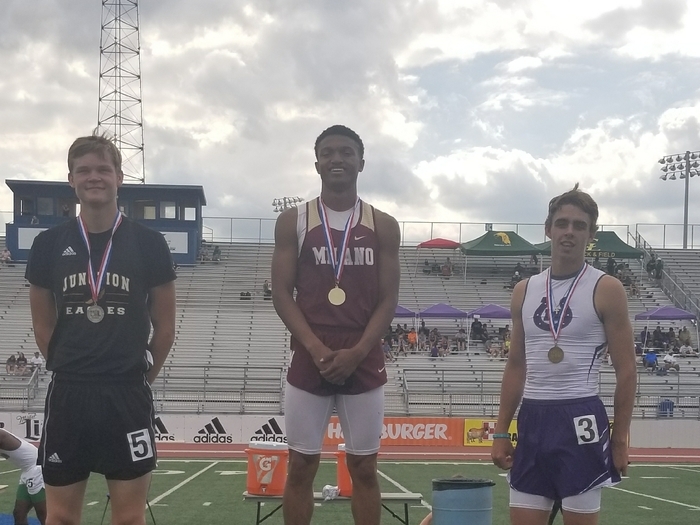 Kaleb Dodd wins the 800 meter run qualifying him for Regionals. Emma Batten wins the 800 meter runs and Abby Miller takes 2nd qualifying both girls for Regionals. Parker Jones wins the 3200 meters equaling his school record of 9:52. Parker advances to regionals. Jaden Carmicheal places fourth and clears 5' 0" advancing to Regional. 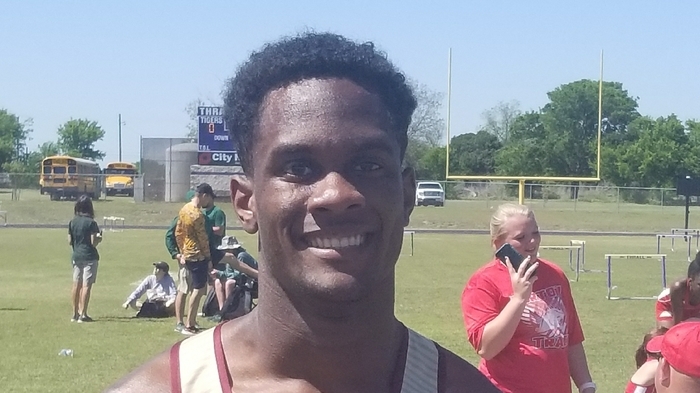 Devonte Jones wins the long jump and Kalie Poehl places 4th in discus, both advancing to Regionals. Seniors last OAP performance. Great job kids. We are all so very proud of you all. Kyle King and Kaleb Dodd earned honorable mention all-star cast. Amanda Storey earned all-star cast. Jeremyah Tafao earned the crew award. The OAP company put on an excellent performance today at Regional competition. Thank you for making Milano proud!! Marcos Ruelas starts strong pitching 2 scoreless innings but the Eagles fall tonight 11-1. Next action Tuesday in Milano vs Rosebud 4:30pm. 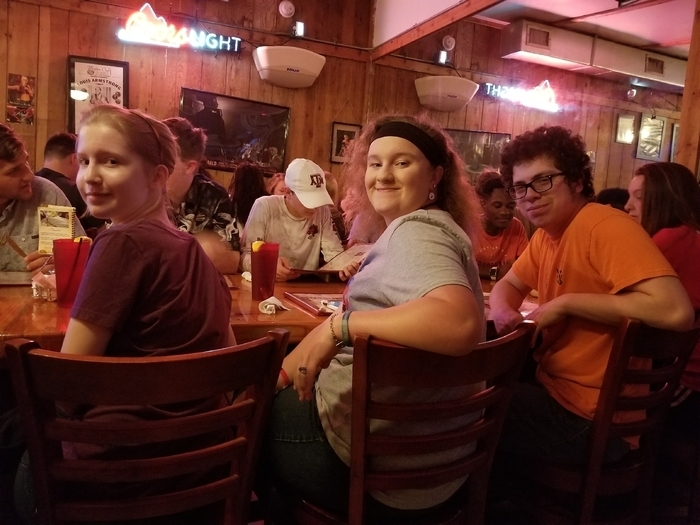 One Act Play company enjoying a meal in Corpus. Regional competition tomorrow at Veterans Memorial HS. Break a leg guys!!! 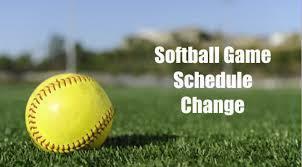 The softball game scheduled for tomorrow, April 13 in Rosebud has been canceled and rescheduled for April 20, @ Rosebud at 6:30. Schedule for Area track, Monday April 16th. Eagle baseball scores 6 runs but falls to the Thrall Tigers 16-6. Next game Friday, April 13 @ Rosebud-Lott 6pm. Lady Eagles take the win over Holland 2-0 behind Jenna Lewis recording 14 strikeouts and Kalie Poehl hitting her 6th homerun of the season. Eagle baseball tonight @Thrall 6pm. 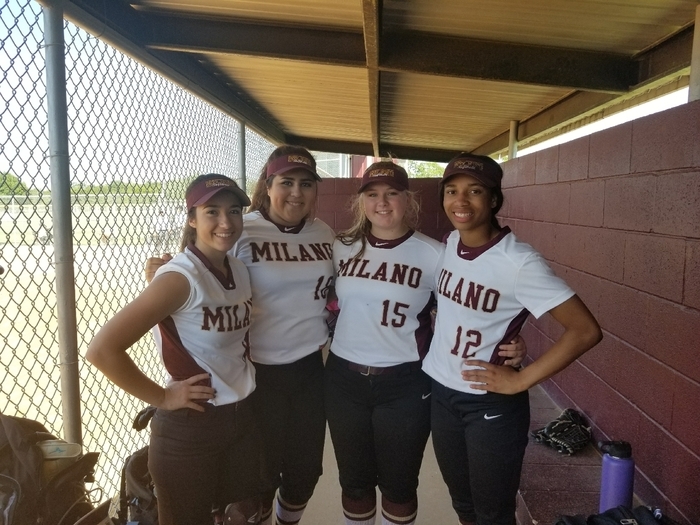 Lady Eagle softball tonight vs Holland in Milano 4:30pm. Come out and support!!! 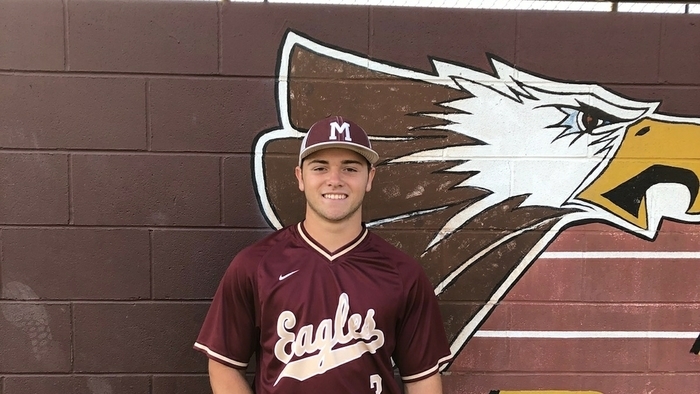 Eagle baseball with a good effort vs Thrall tonight making a late run in the bottom of 6 led by Cody Starkey's two run double. Tigers 14-4. Baseball game vs Thrall has been canceled today. Game is rescheduled for 4:30 Monday April 9 in Milano. Junior high track meet stopped after the 300 hurdles due to lightning. There will be no makeup. Eagle baseball falls short tonight to Granger 14-1. Next action tomorrow vs Thrall at home. 10:00am start. Lady Eagles softball takes the win over Bremond tonight 10-2. 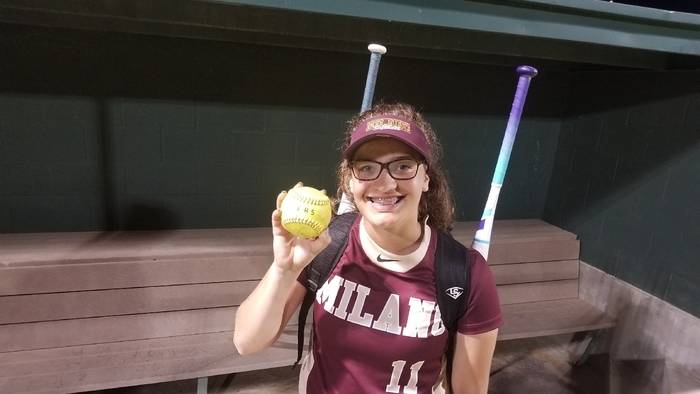 Kalie Poehl hits her 5th homerun this season. Way to go ladies!! 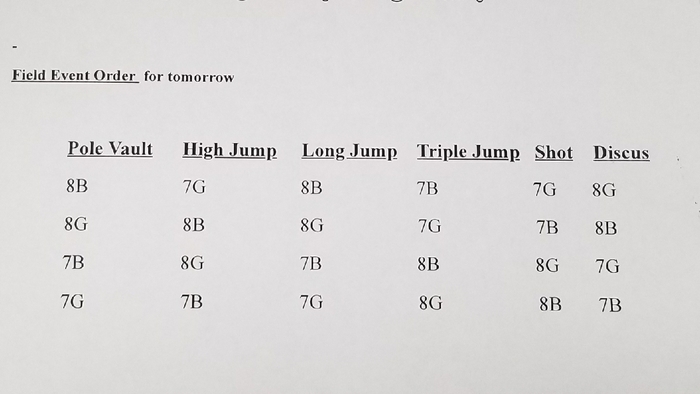 Field event order for JH meet today in Holland. JH District track meet Friday, April 6 @ Holland. Field events will begin at 4pm and running events around 6pm. Lady Eagle softball will be in action tomorrow, March 31 vs the Thorndale Lady Dogs. Game time is 2 pm @ Milano. Milano ISD is currently experiencing phone issues. We have turned it in for repair. Please email if you need assistance, email addresses can be found on our website. This is an important message from Milano ISD. Due to the inclement weather approaching Milano ISD will cancel school for tomorrow, Tuesday January the 16th. The basketball games scheduled tomorrow against Holland at home has been rescheduled to Wednesday the 17th, same times for all teams. The varsity boys basketball game scheduled against Bartlett tomorrow 01-05-2018 has been cancelled. Community-Wide Pep Rally: Thursday 11/16 Starting at 6PM with burgers, followed by celebrating the Eagles heading to the playoffs! Tonight's school board meeting has been canceled. Parents, Progress Reports will be sent home on Wed, Oct. 25th. This is a 5-week grading period. Only 2 weeks remain before Report Cards come out. Congrats Caleb Stevenson! 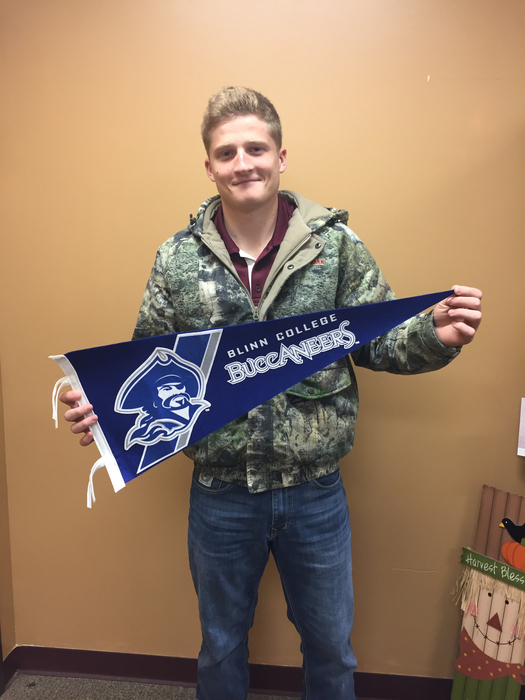 He has been accepted into Blinn College. Congratulations to Justin Gage and Hannah Batten! Today Justin and Hannah were awarded 3rd and 2nd place, respectively, as well as a cash prize for the 2016 Patriot's Pen writing contest. 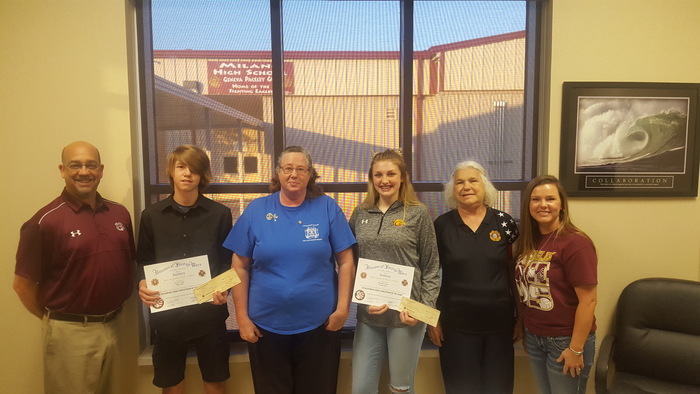 Thank you to the VFW and the VFW Ladies Auxiliary for sponsoring this contest, and congratulations to all the winners and participants. UPDATE: The football game is at 7pm tonight against St. Joseph. The address to the field is 6044 Rye Loop Road, Bryan, TX 77807. Directions: If traveling from Caldwell: Turn left onto TX-OSR E and continue for 6 miles. 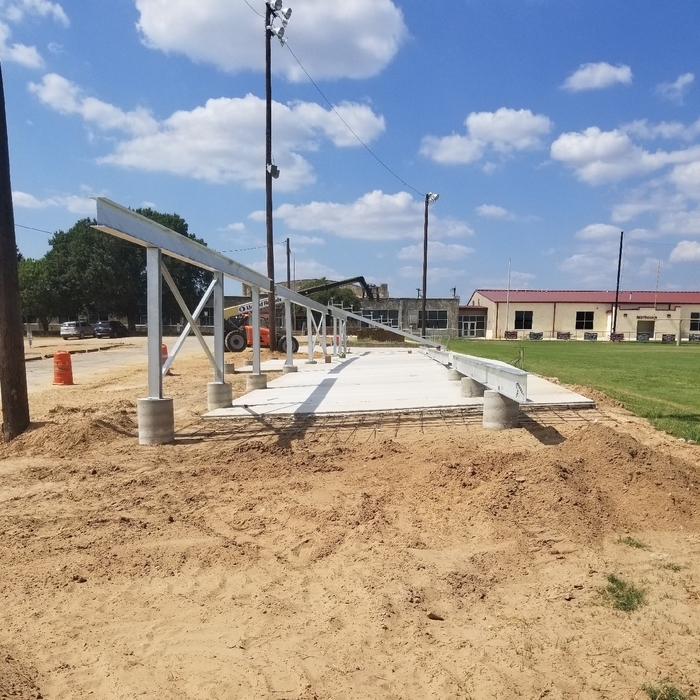 The field will be on the left side of TX-OSR E. If traveling from Hearne: Follow US-190 E/US-79 N to Texas 6 Frontage Rd S in Robertson County. Take the Texas 231 Spur exit from US-190 E. Continue on Texas 231 Spur for 3.3 miles. The field will be on the right side. If you have the Milano ISD App, you can get directions on your phone as well. Dress Code Policy Change (Secondary): Inappropriate or Unacceptable Attire: Shorts or skirts shorter than 3” (inches) above the knee. Cross Country ran at Jarrell on Sat., Sept. 16th. Bessi Simpson took 13th in the JH girls race. Parker Jones won his 3rd consecutive meet in a row, posting a personal best 3 mile time of 15 min and 49 secs. **SEPTEMBER 14th JH FOOTBALL TIME CHANGE** The JH football game @ Bremond has been changed to 5:00PM. The JV game will follow. MILANO ELEMENTARY PARENTS: The FIRST PEP RALLY of the year is this Friday, September 1, 2017. MES students will walk to the High School gym with their teacher to participate in the pep rally. If you do not want your child to go to the pep rally, or you want to take them yourself, you MUST pick them up from MES by 2:20pm. You will not be able to sign them out in the MHS gym during the pep rally. After the pep rally: -car riders will need to be picked up in the car rider line in front of the high school -bus riders will be put on the bus at the high school The theme for the pep rally is NEON! Please have your child wear NEON on Friday! Go Eagles! Thanks for your cooperation! Our little Eagles LOVE pep rallies and in order for all 172 of them to participate, we have these safety measures in order. We appreciate you, parents! Phone service has been restored to Milano ISD. At this time phone systems for Milano ISD are down. A trouble ticket has been submitted to get them repaired. We apologize for the inconvenience. Milano ISD will start school at 10:00 in the morning. Buses will run approximately 2 hours and 15 minutes later than normal. We are following weather updates and making decisions based on the latest information available. Although major roads are open, we are taking conditions within the district and area into consideration. Please do not take any unnecessary risks if weather and road conditions do not allow for safe travel to school. Our Tardy policy has changed this year. See the Student Secondary Handbook (HS & JH), pg. 20 for more details. Our cell phone policy has changed this year. There is $15.00 fee per violation. See the Student Secondary Handbook (HS & JH), pg. 58. The Varsity Football scrimmage against Anderson-Shiro has been changed to Friday, August 25 at 7:00 PM. 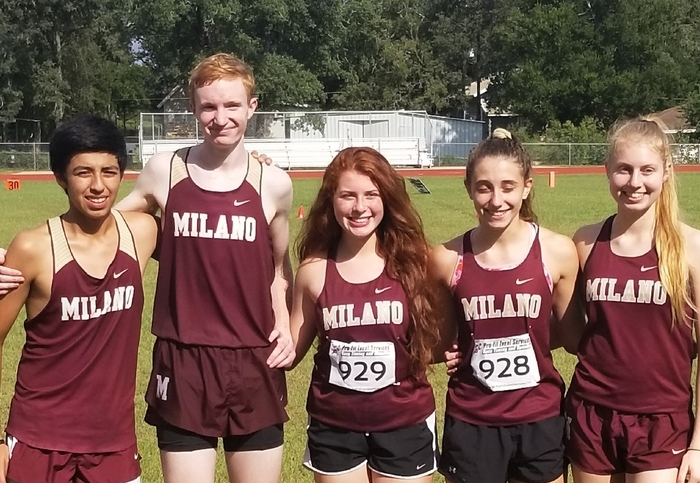 Milano Girls took 2nd at today's Cross Country Meet. Way to go ladies!!! Volleyball Location Change for August 15th!!! The game that is scheduled tomorrow at Little River Academy has changed locations. The game will now be played in Milano, with the first game beginning at 5:00pm. The first day of HS Football practice will be Monday, August 7th. All players need to report at 7:30am. Players must have a physical on file at the HS office before they will be allowed to practice. Milano ISD has amended the 17-18 school calendar. The 1st day of school will now be on Monday, August 21st. You can find an updated copy from the school website.